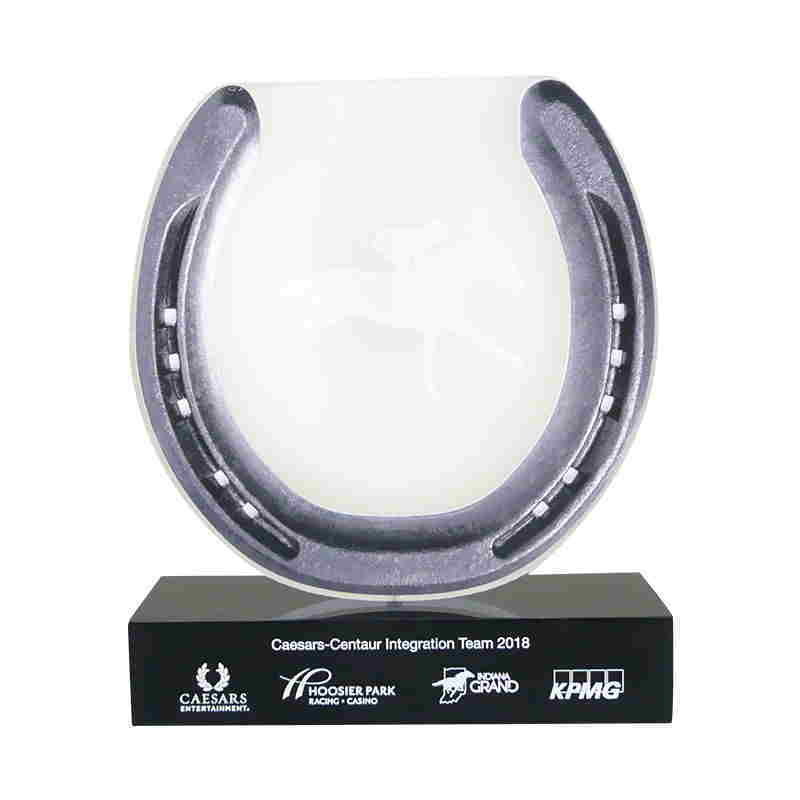 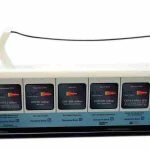 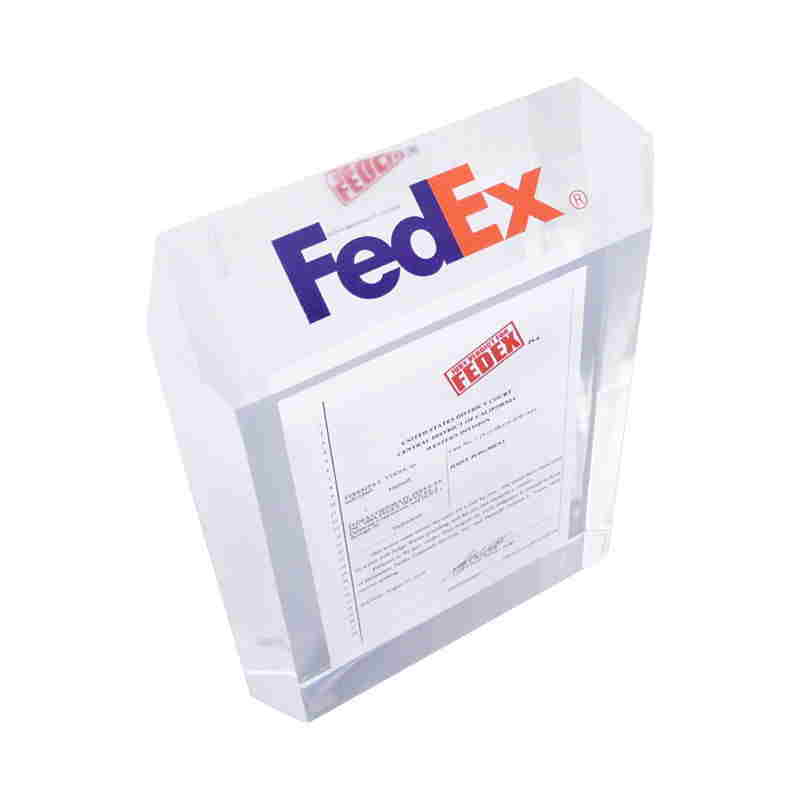 Prestige Custom Awards is the industry leader for deal toys and financial tombstones.We have over 30 years of experience designing deal toys internationally in all media—including crystal, Lucite/acrylic, and wood. 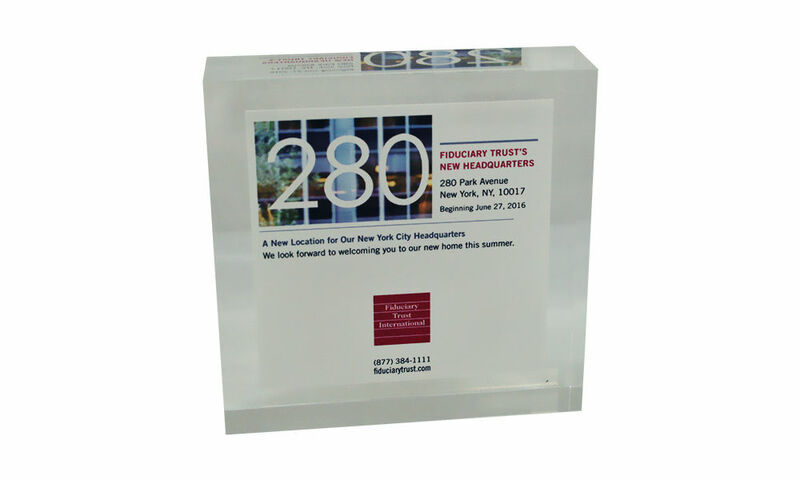 Custom Lucite celebrating the 20th anniversary of the listing on the New York Stock Exchange of Kansas City, Missouri-based REIT EPR. 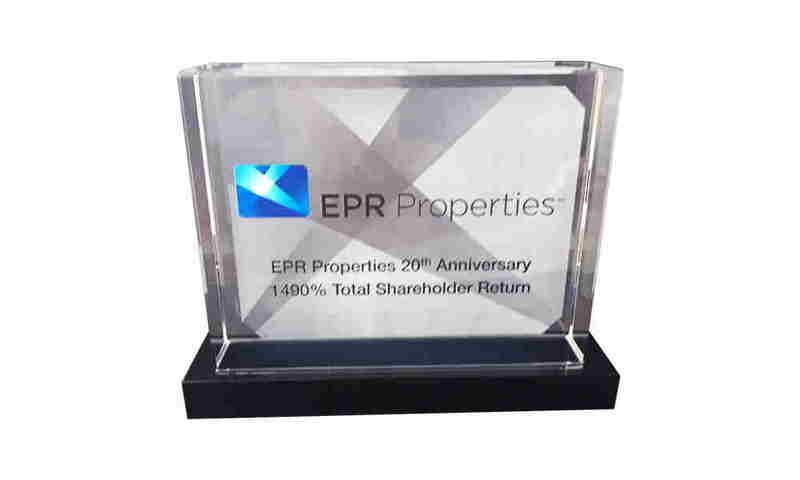 Executives of EPR marked the occasion by ringing the NYSE Closing Bell. 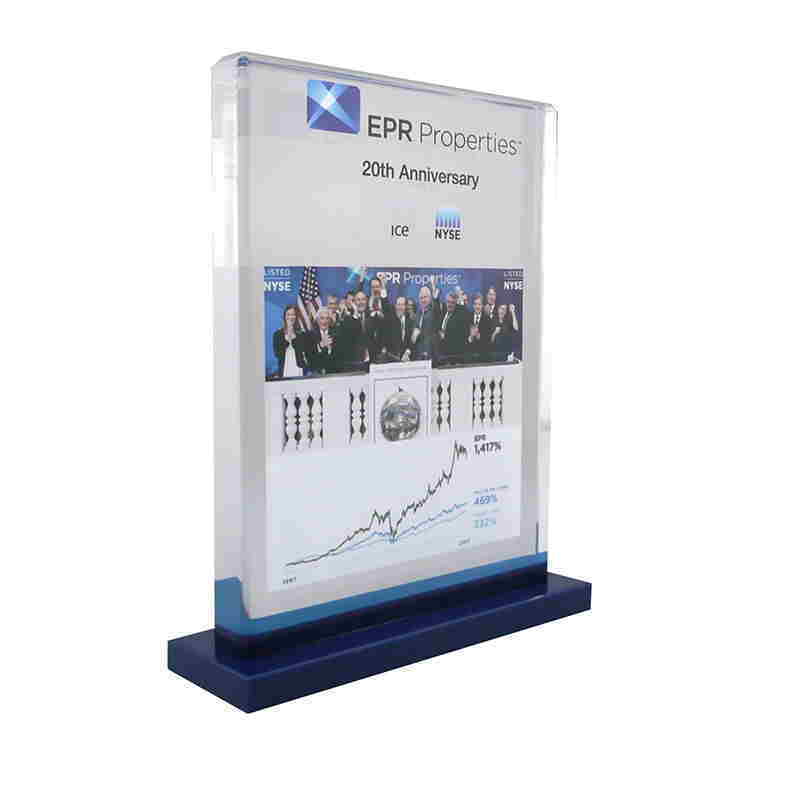 Custom Lucite commemorating the ringing of the closing bell by executives of EPR properties. 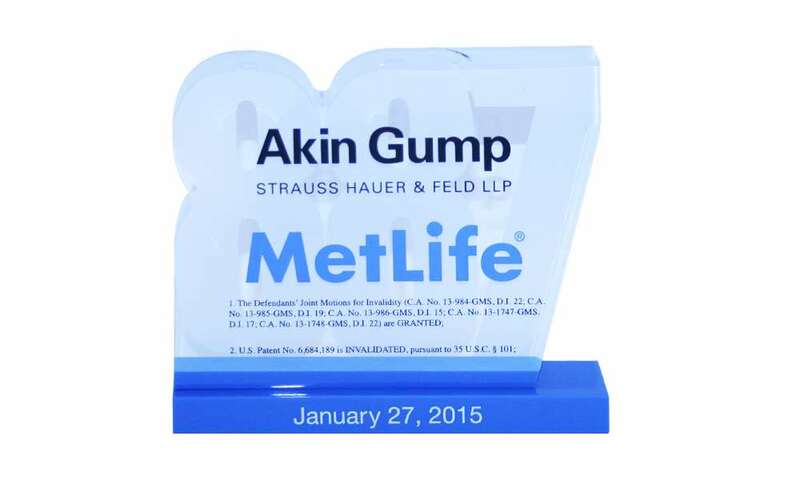 The ceremony marked the 20th anniversary of the real estate investment trust's listing on the New York Stock Exchange. 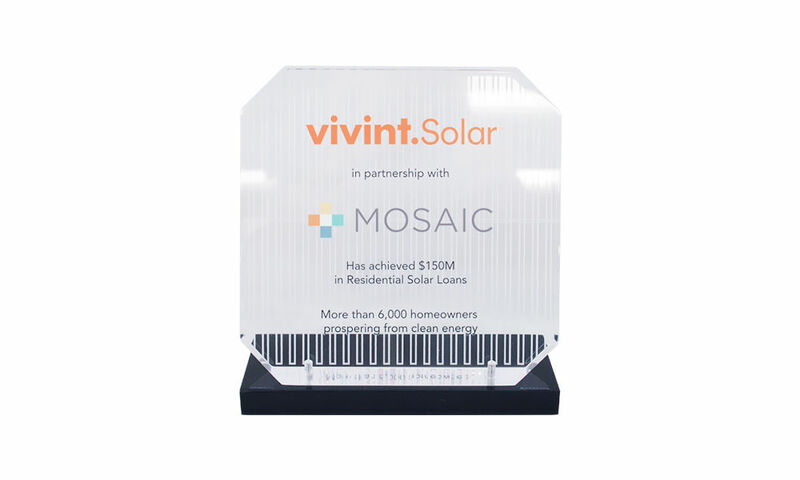 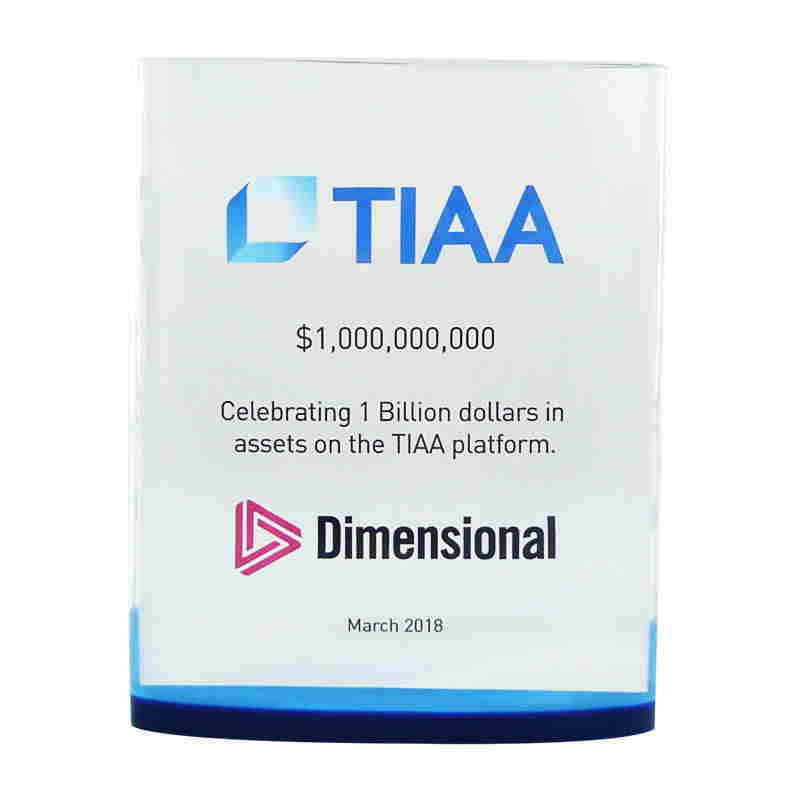 Custom Lucite award recognizing the surpassing of an asset milestone by TIAA. 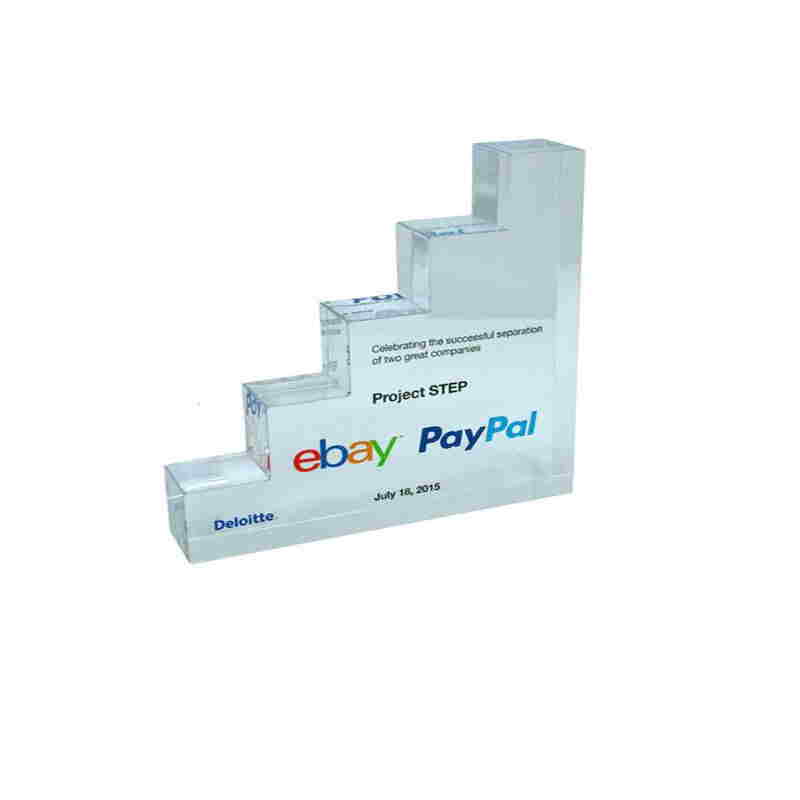 Step-themed custom acrylic commemorating the separation of PayPal and eBay. 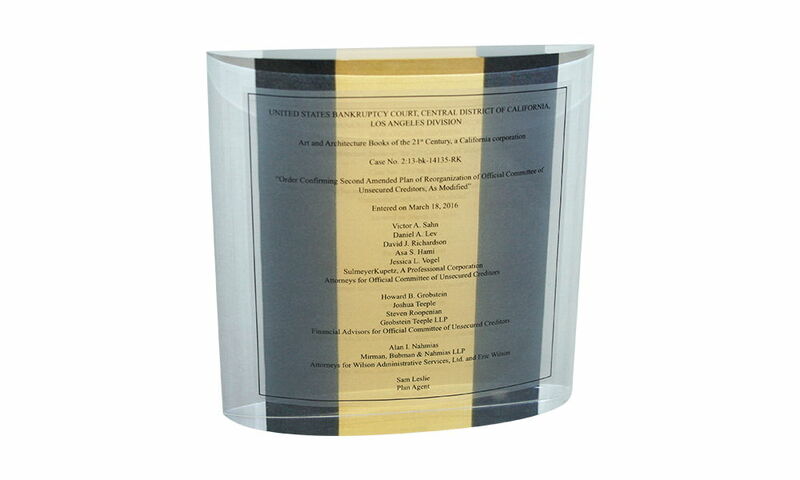 Custom Lucite commemorating a favorable federal court ruling. 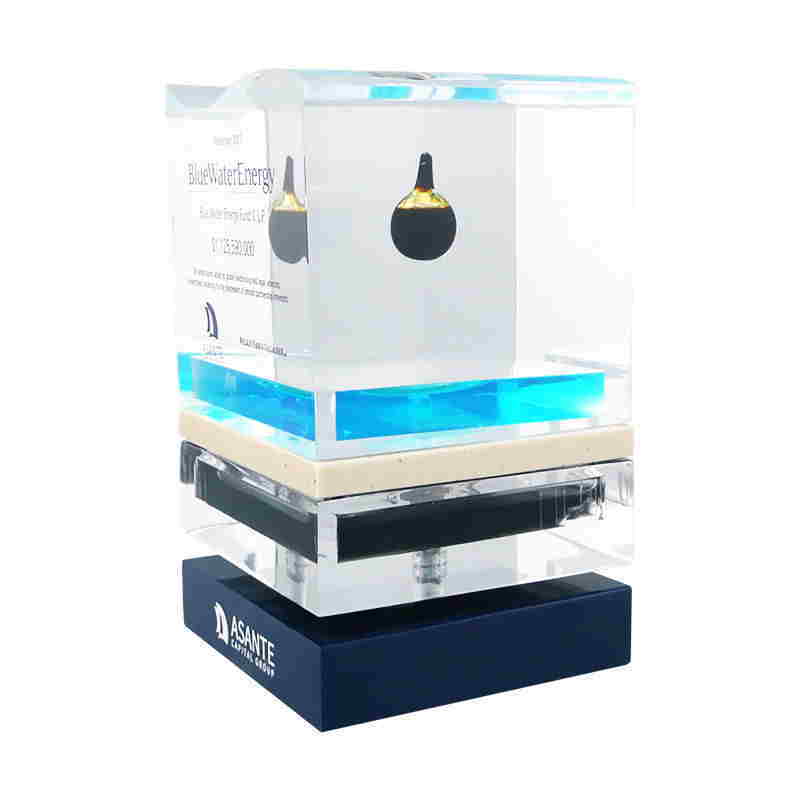 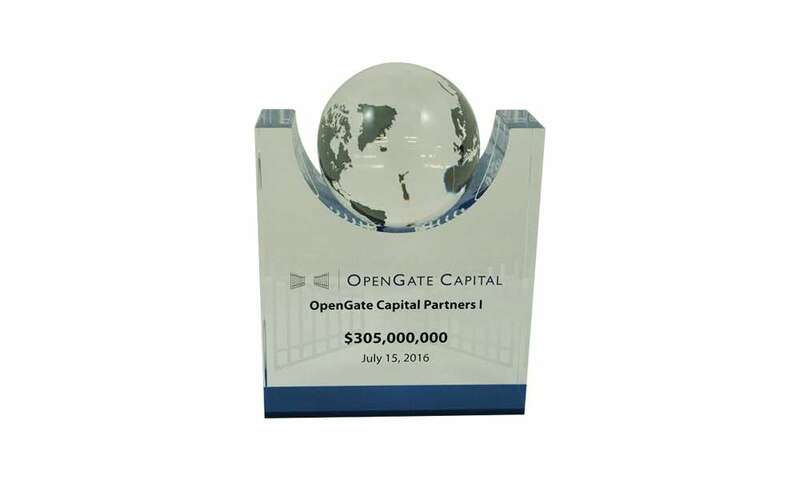 Lucite commemorating the acquisition and onboarding by Bottomline Technologies of First Capital Cashflow. 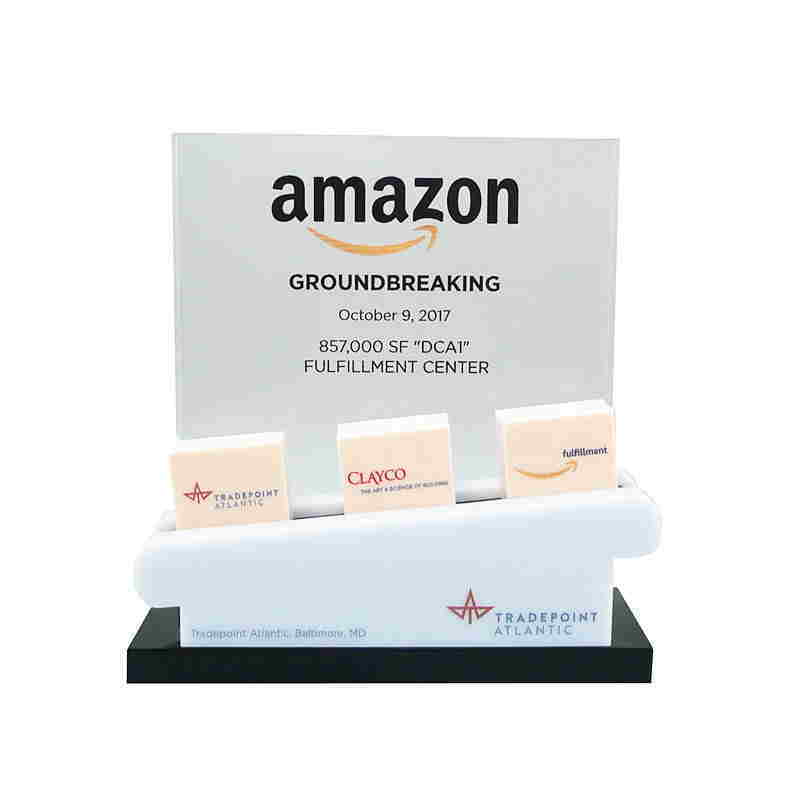 Custom Lucite commemorating the groundbreaking for Amazon's fulfillment center in Baltimore, Maryland. 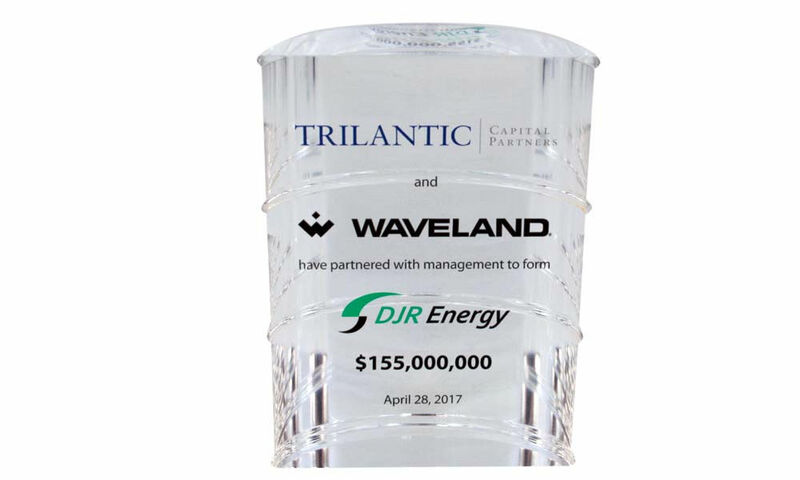 The 855,000 square-foot facility will be located at the Tradepoint Atlantic industrial park. 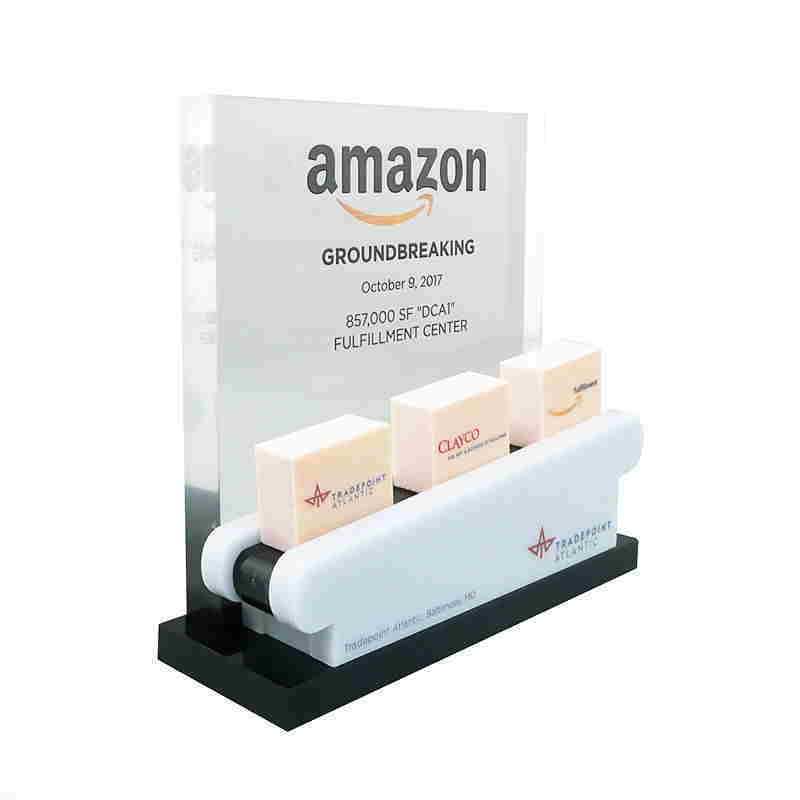 Conveyor belt-themed custom Lucite commemorating the groundbreaking for Amazon's 855,000-square-foot fulfillment center at Baltimore's Sparrows Point. 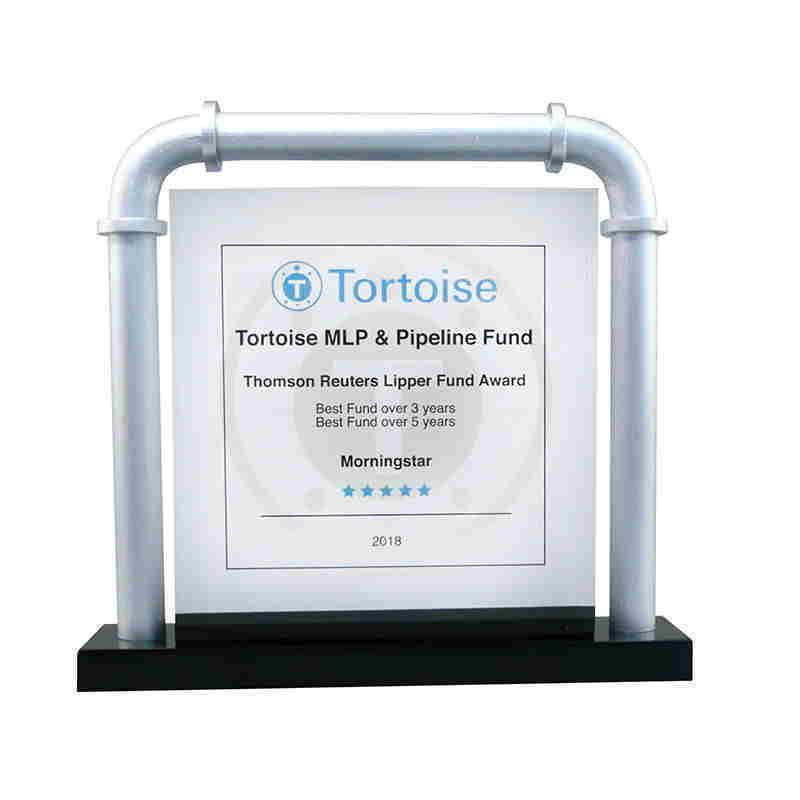 Custom commemorative recognizing the Tortoise MLP & Pipeline Fund as a recipient of a 2018 Thomson Reuters Lipper Fund Award. 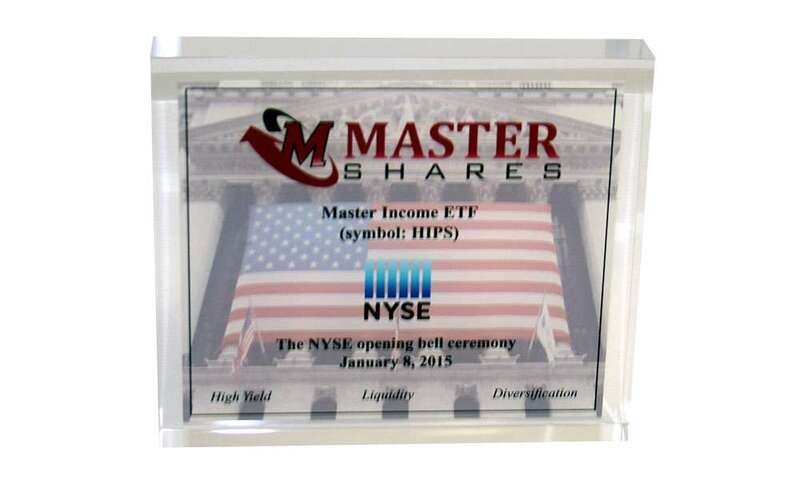 The fund was recognized in the category of Energy MLP Fund. 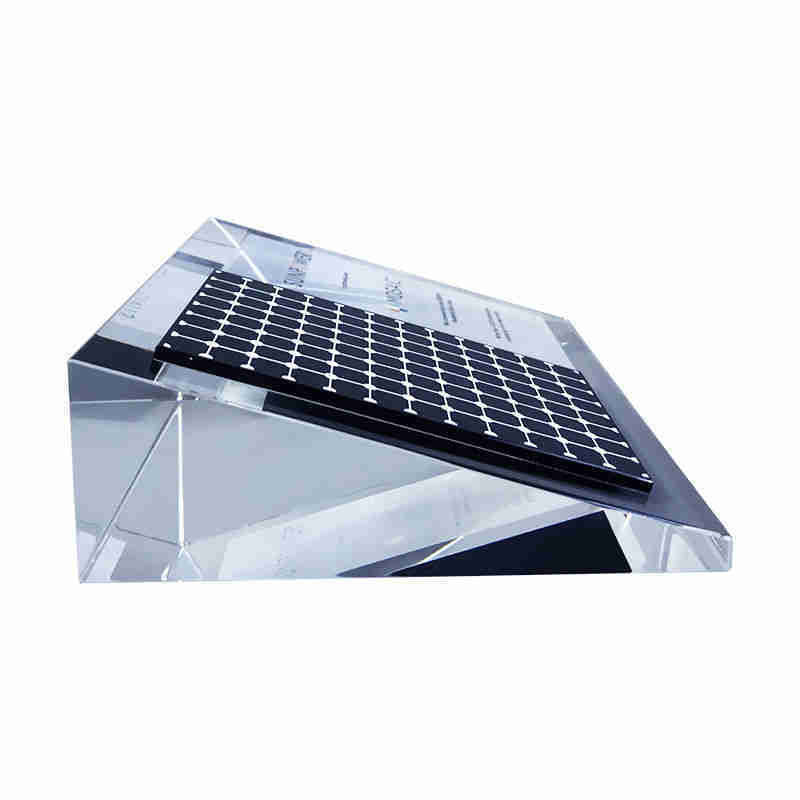 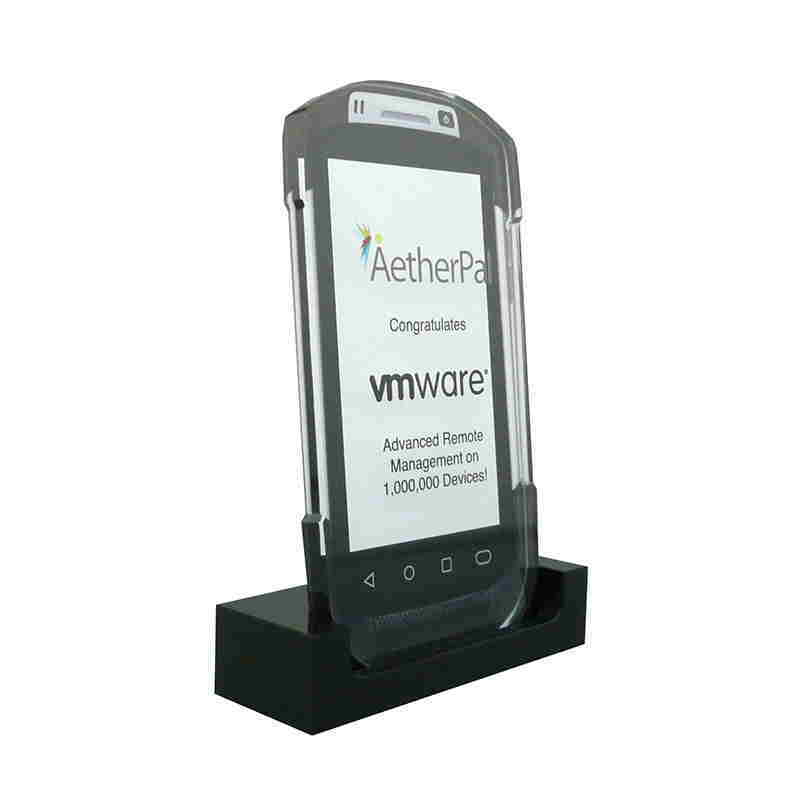 Custom Lucite commemorating the launch by Merrill Corporation of DatasiteOne. 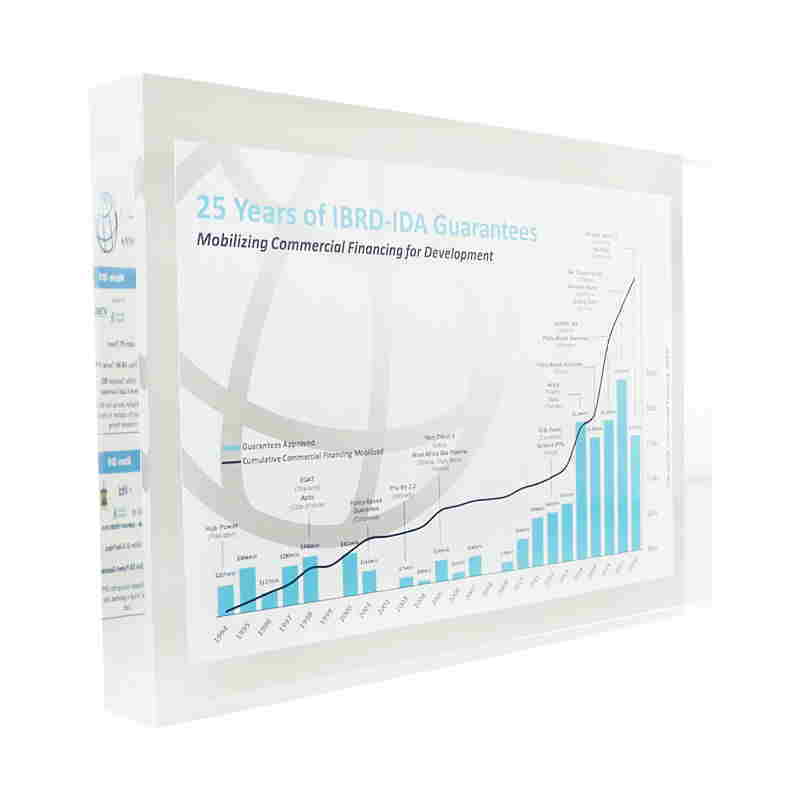 The SaaS application is designed to fulfill a range of due diligence related to deal making for the legal, private equity, corporate development, and investment banking communities. 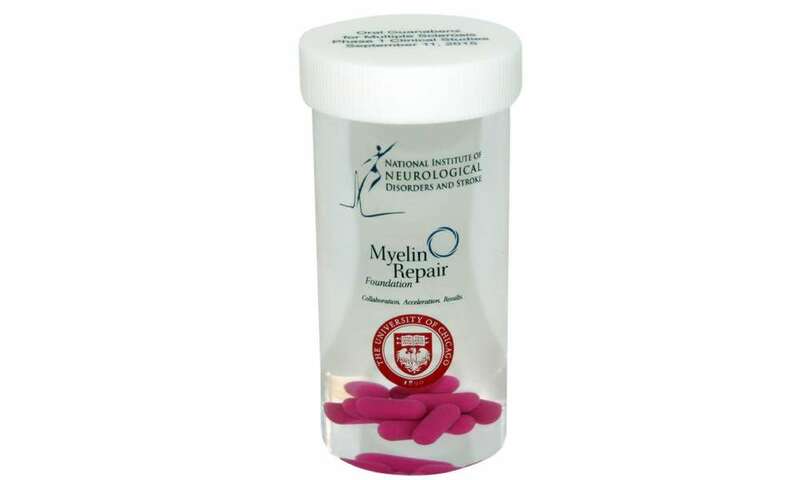 Pill bottle-themed custom acrylic award recognizing phase 1 studies of treatments for myelin damaged by multiple sclerosis. 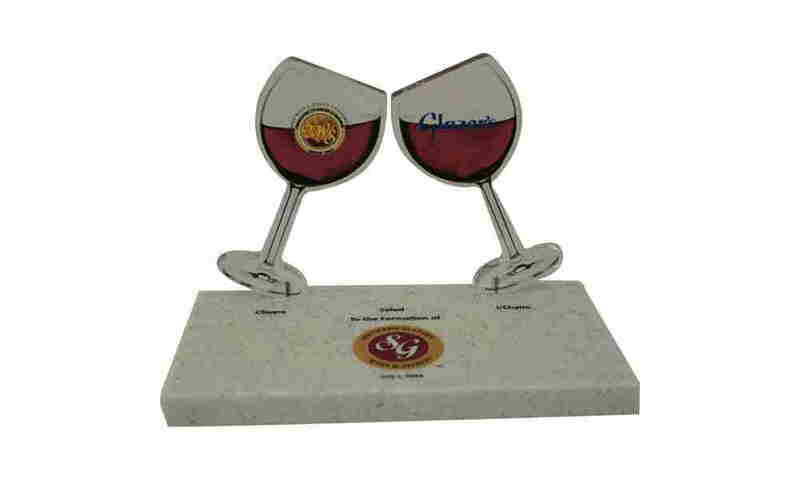 Wine glass themed custom Lucite celebrating the launch of beverage distributor Southern Glazer's Wine and Spirits, serving the U.S., Canada, and the Caribbean. 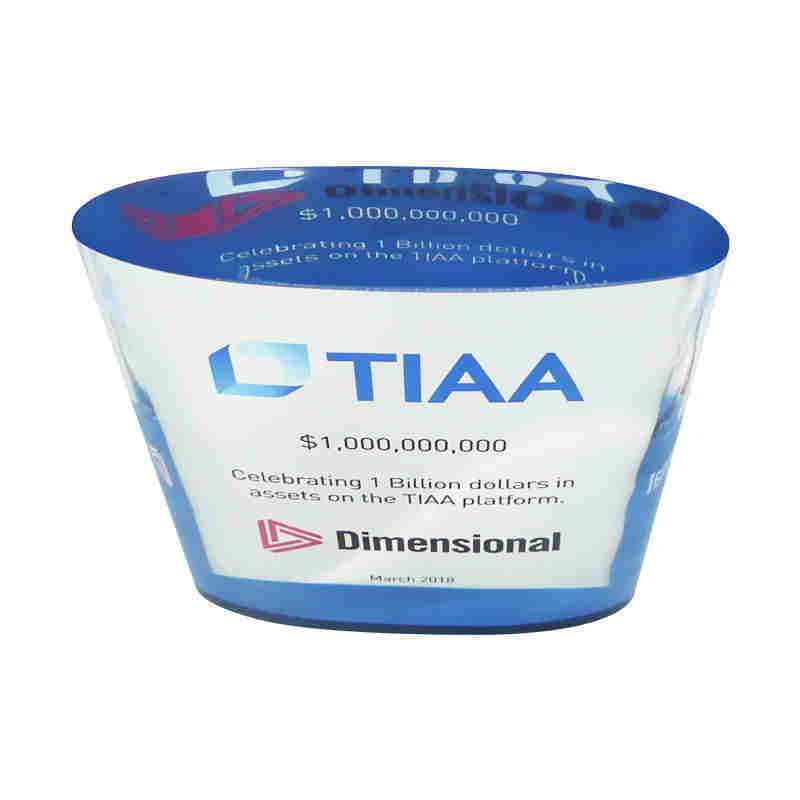 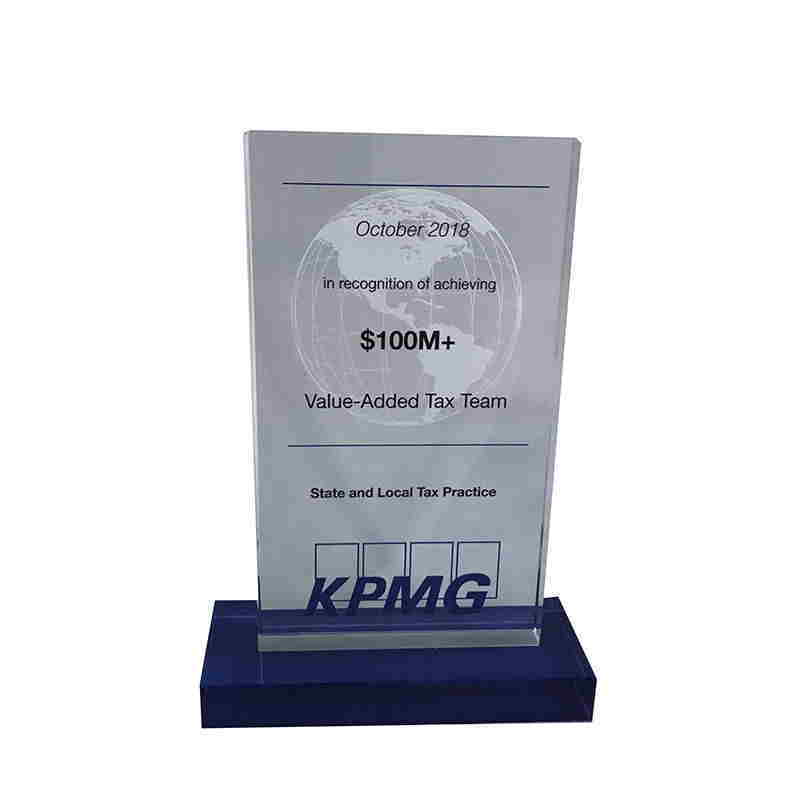 Custom acrylic award marking the achievement of an asset milestone at TIAA. 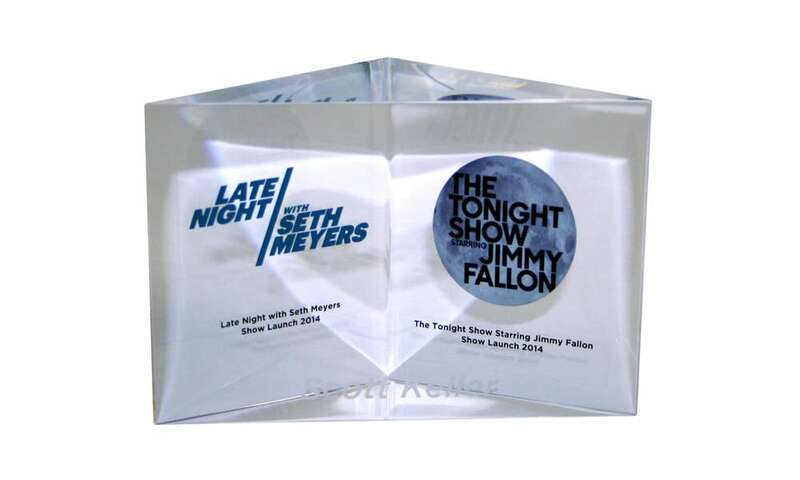 Custom Lucite with personalization celebrating the launch of two NBC shows: "Late Night with Seth Myers" and "The Tonight Show Starring Jimmy Fallon". 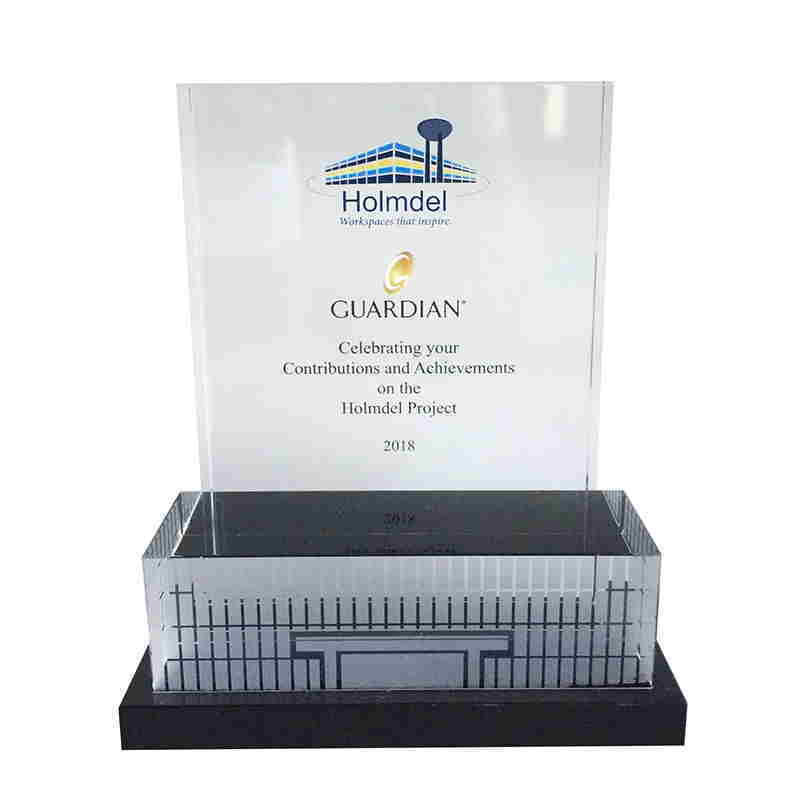 Custom Lucite award recognizing the contribution of team members at LeanPath to sustainability. 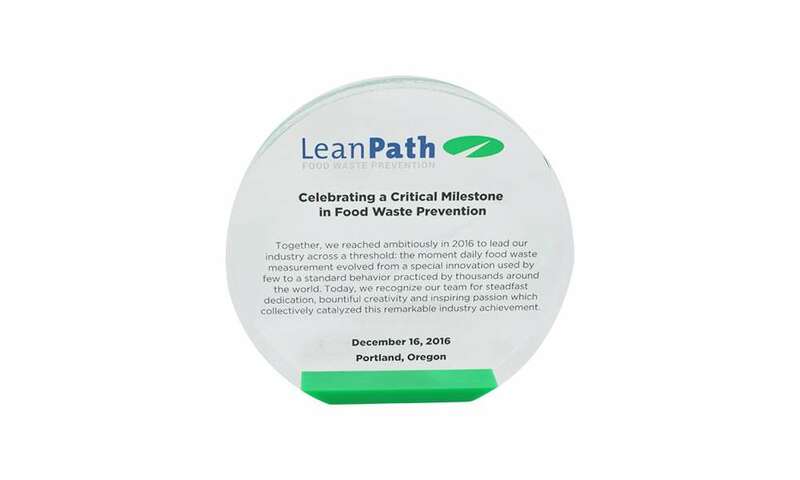 Based in Portland, Oregon, LeanPath is focused on reducing food waste in high-volume kitchens. 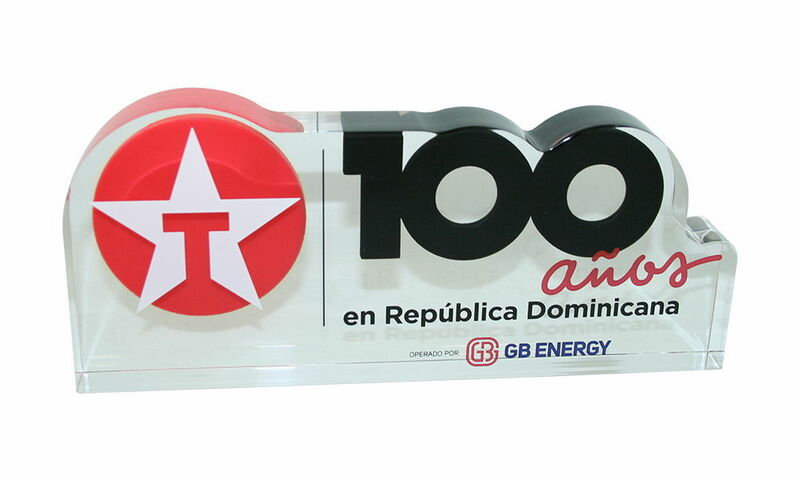 Custom acrylic award marking Texaco's 100th year of operations in the Dominican Republic. 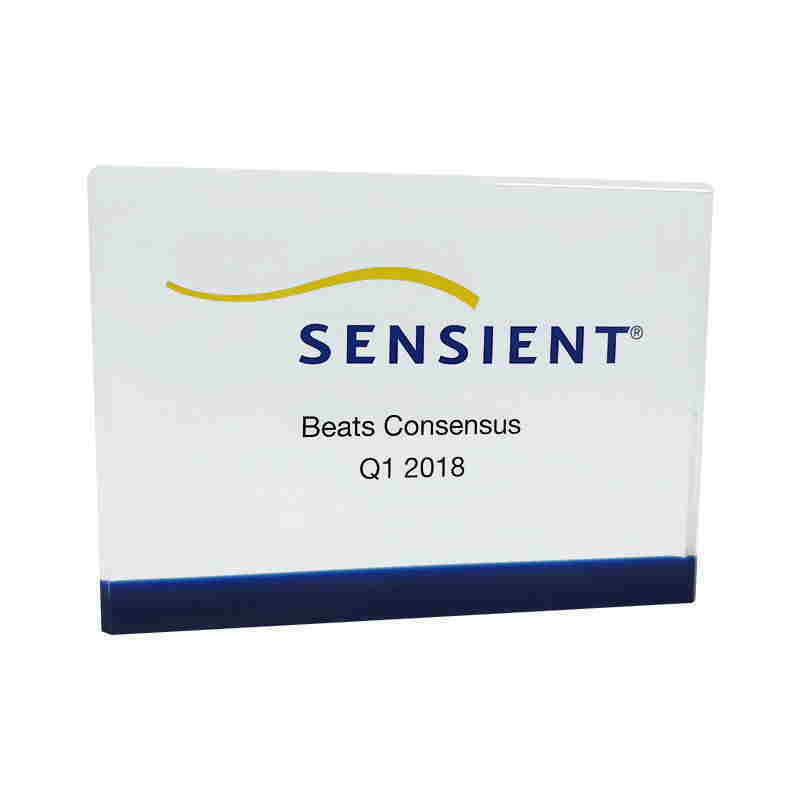 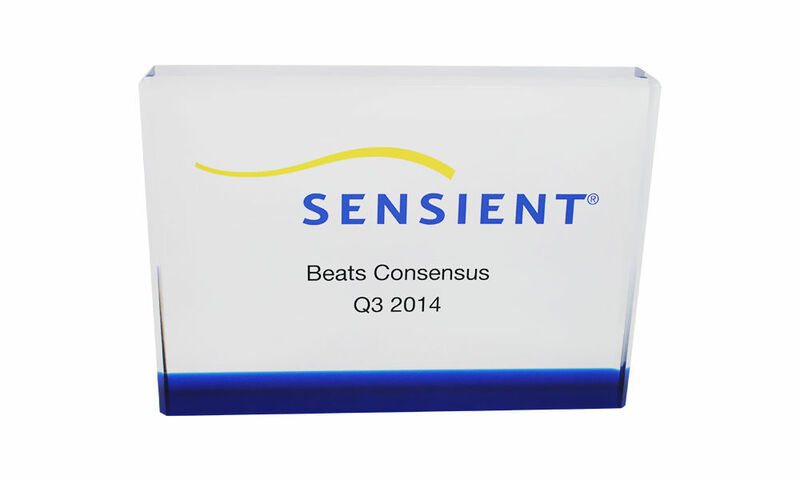 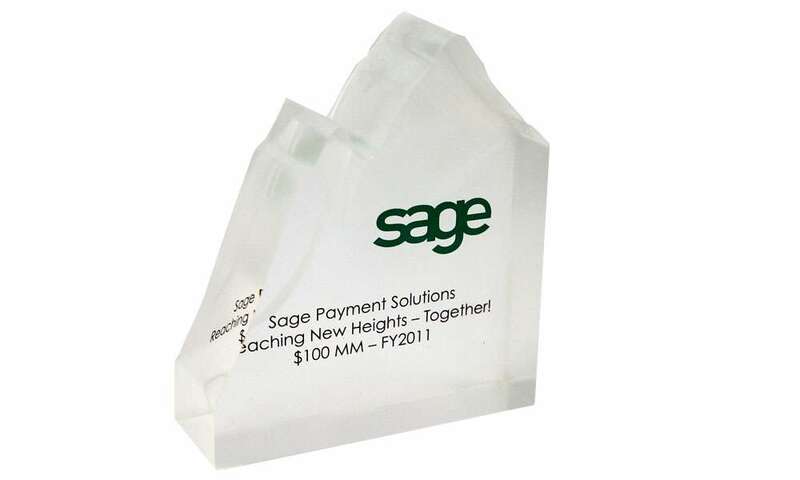 Custom acrylic award commemorating the quarterly earning of Sensient Technologies exceeding estimates. 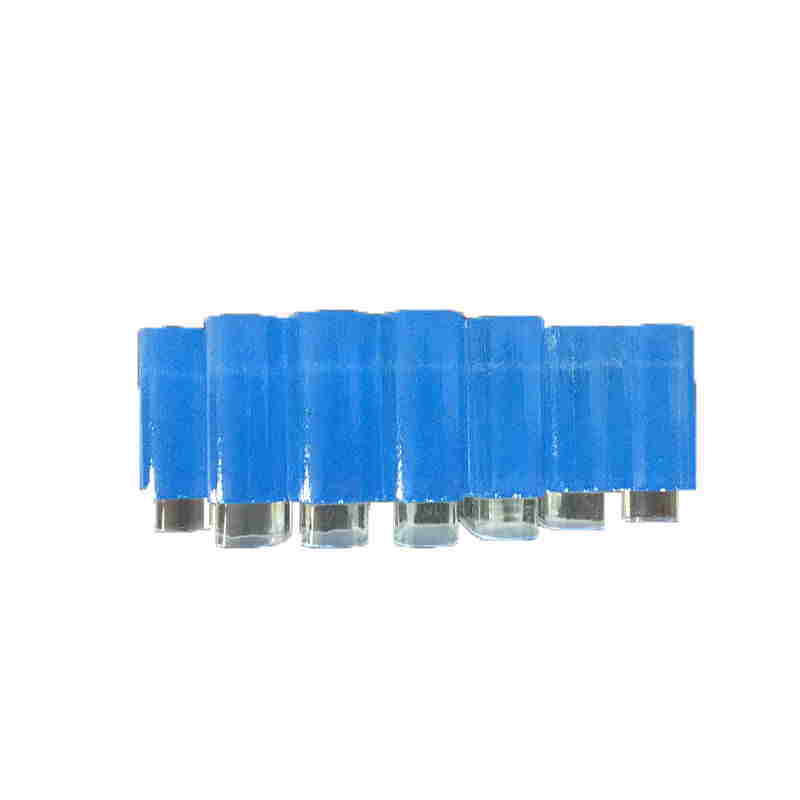 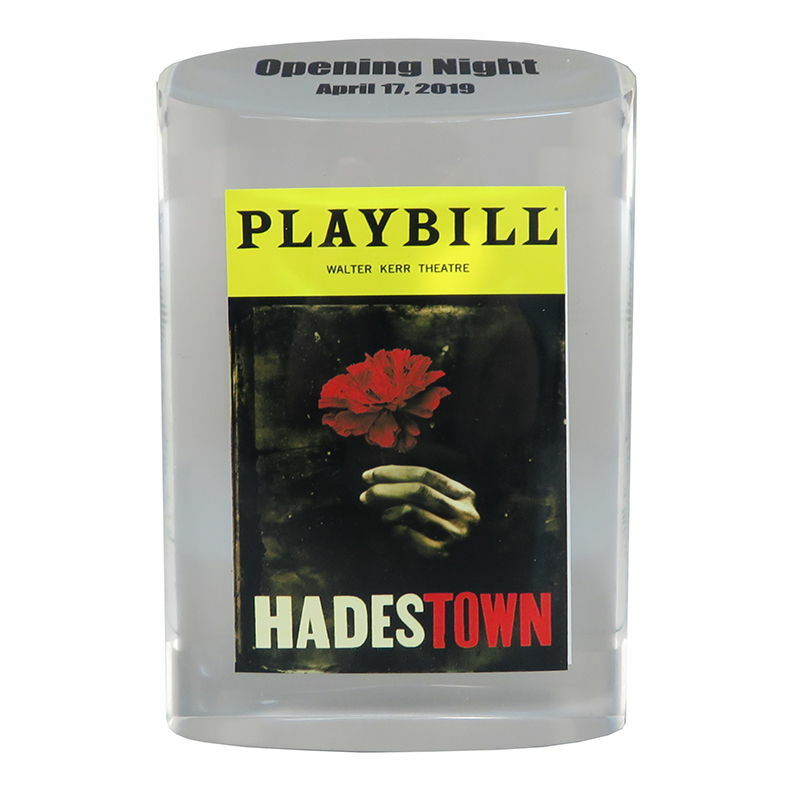 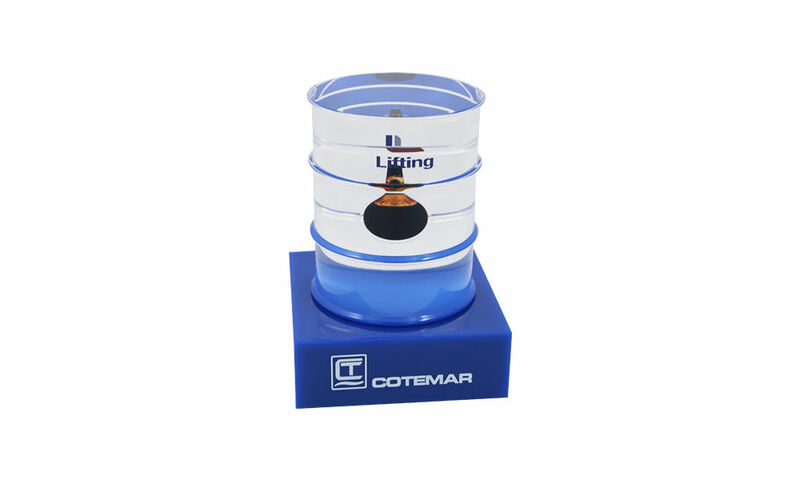 The company produces fragrances and flavors for a variety of product applications. 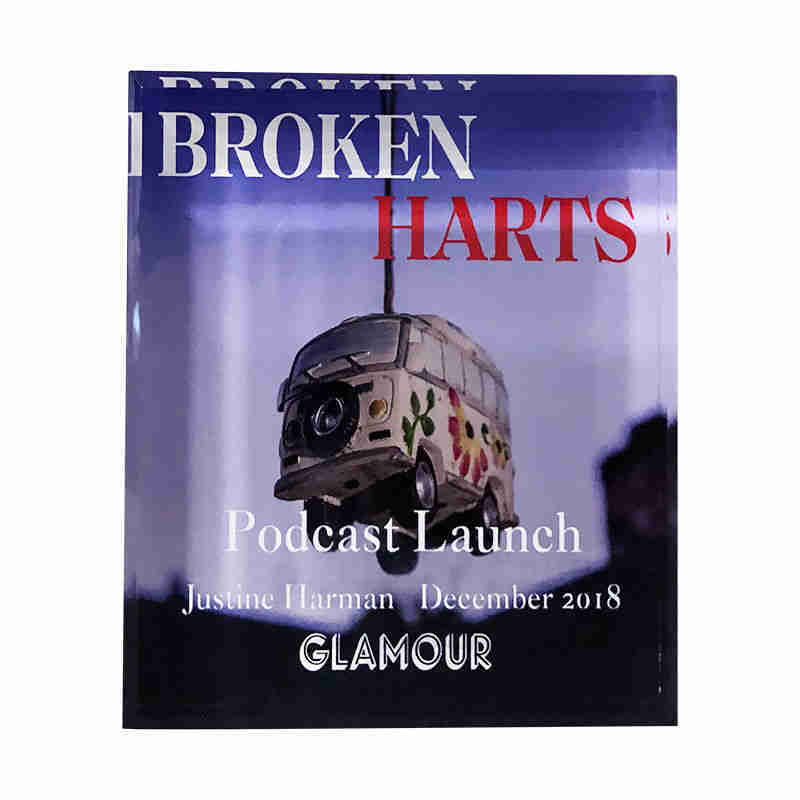 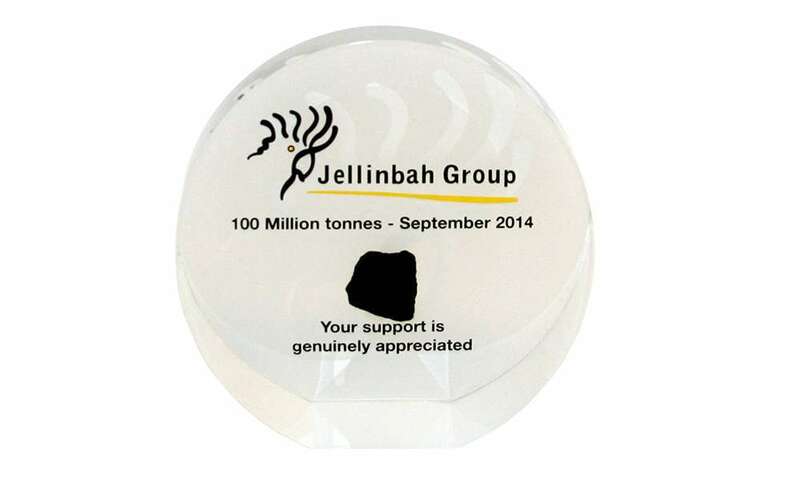 Custom Lucite with embedded piece of coal celebrating the achievement of a production milestone by the Jellinbah Group. 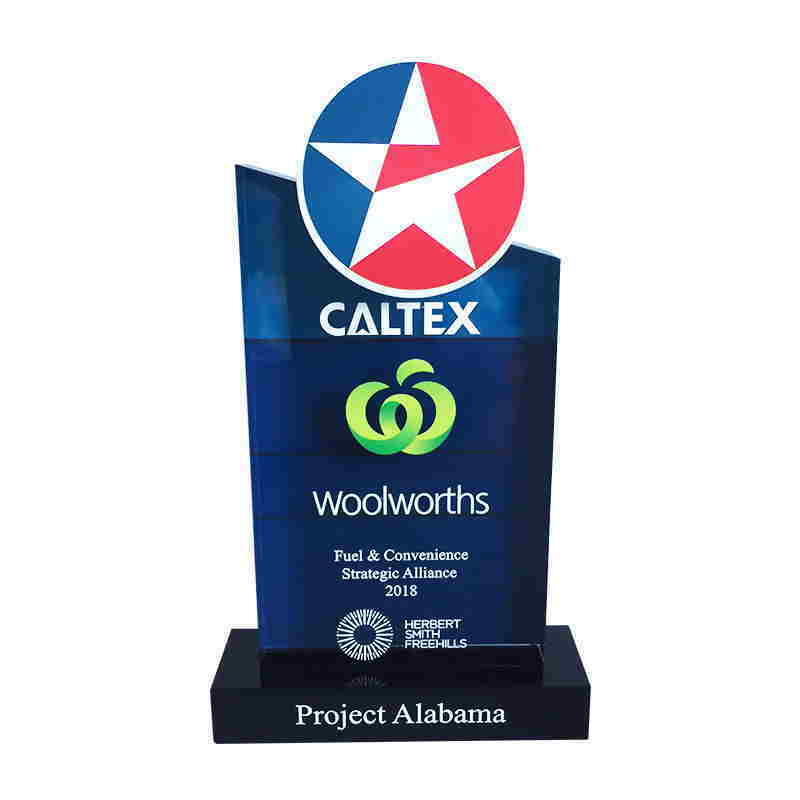 Jellinbah operates two coal mines in Australia. 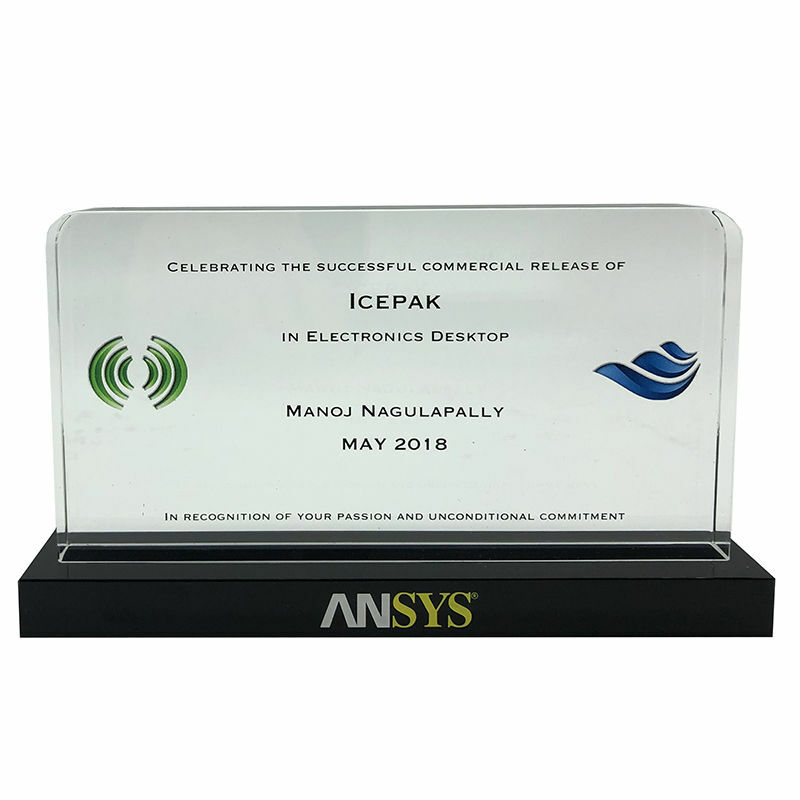 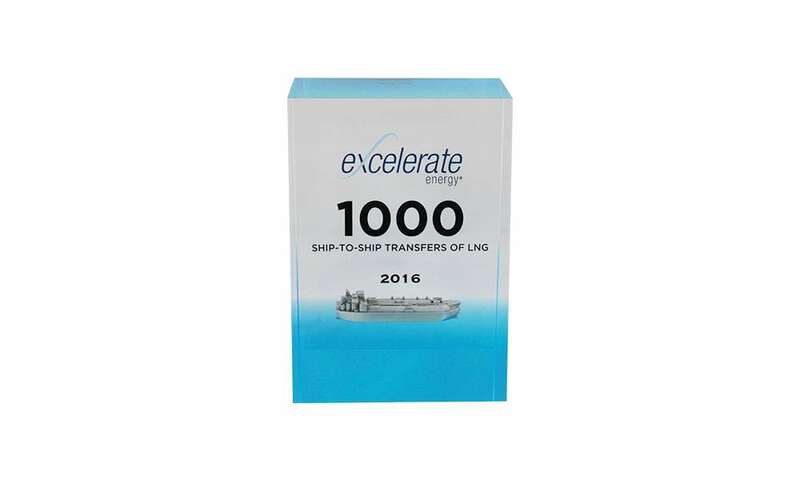 Shipping-themed custom acrylic team award, celebrating the completion by Excerlerate Energy of its 1000th commercial ship-to-ship transfer of liquid natural gas (LNG). 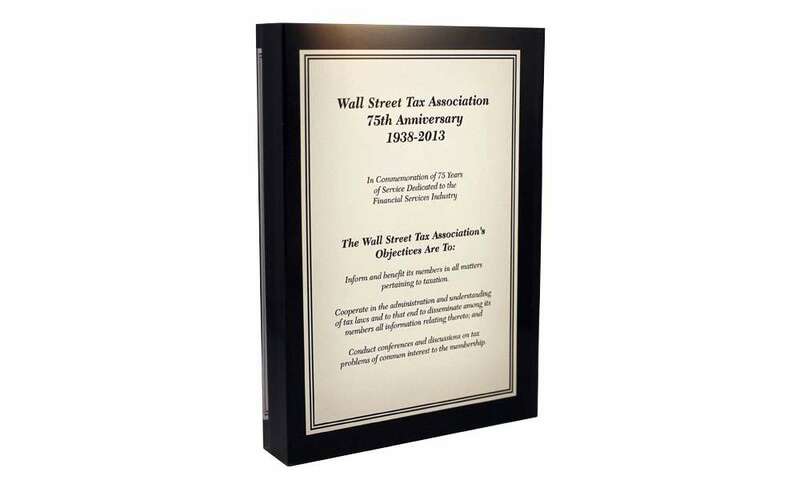 Custom Lucite commemorating the 75th anniversary of the Wall Street Tax Association. 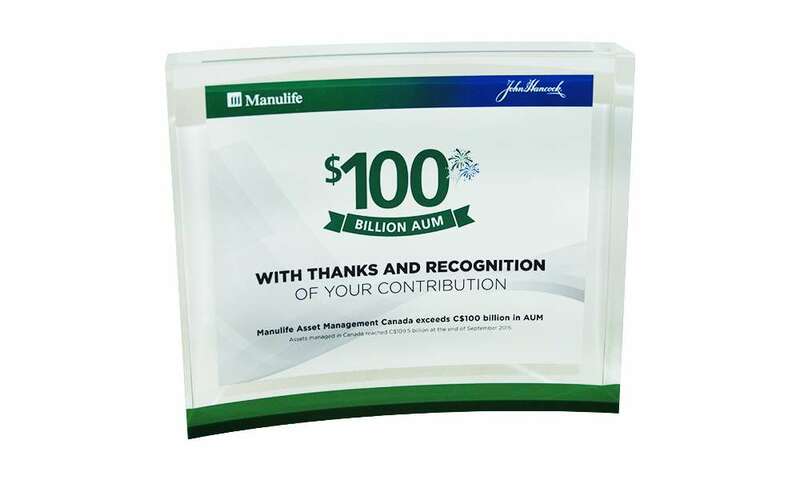 Custom Lucite celebrating the Manulife Asset Management surpassing c$100 billion under management in Canada. 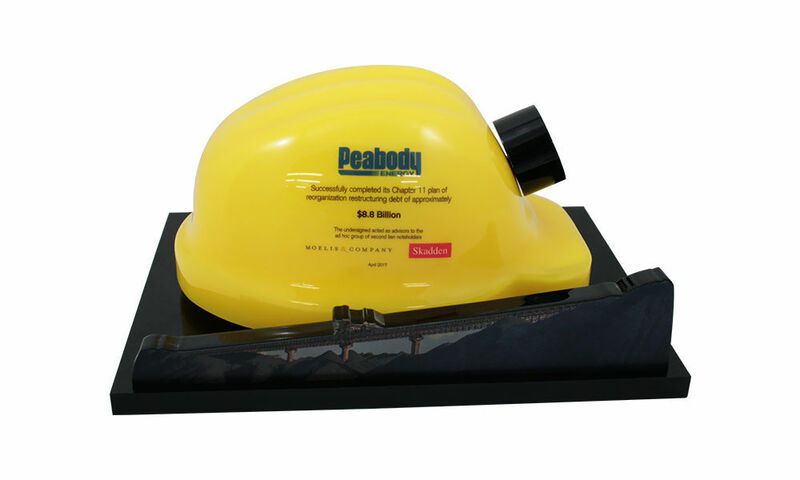 Mining helmet-themed custom acrylic award recognizing the successful emergence of Peabody Energy from Chapter 11 bankruptcy. 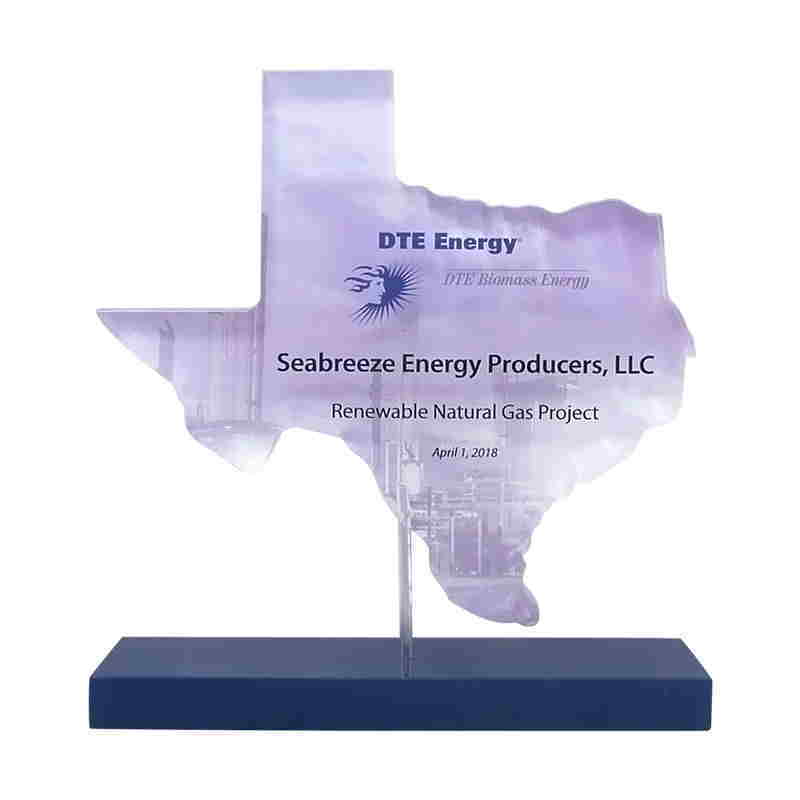 Peabody is the world's largest private-sector coal company. 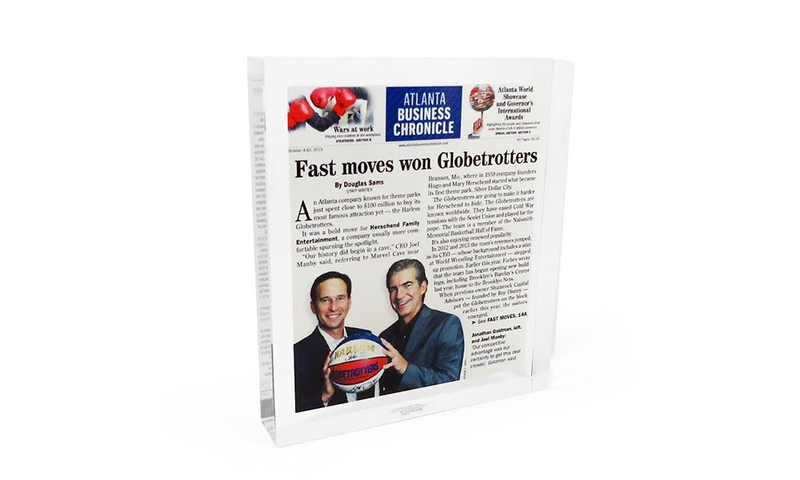 Lucite commemorative showcasing an article on Herschend Family Entertainment's acquisition of the Harlem Globetrotters. 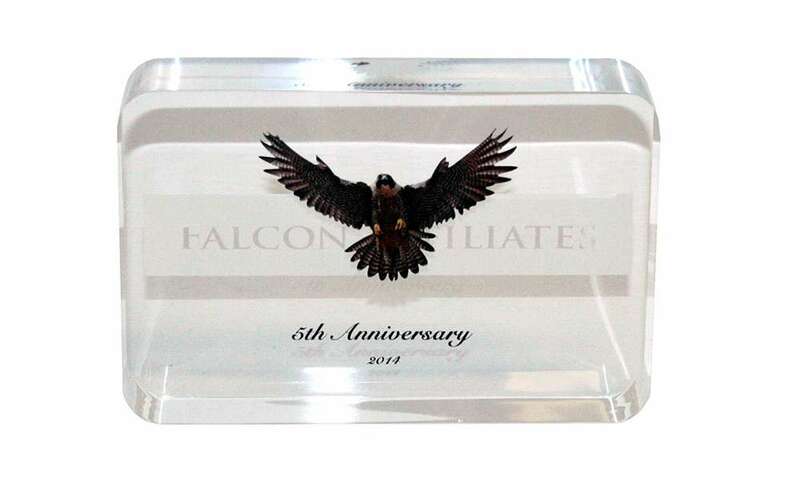 Custom Lucite commemorating the 5th anniversary of the founding private equity firm Falcon Affiliates, based in Richmond, Virginia. 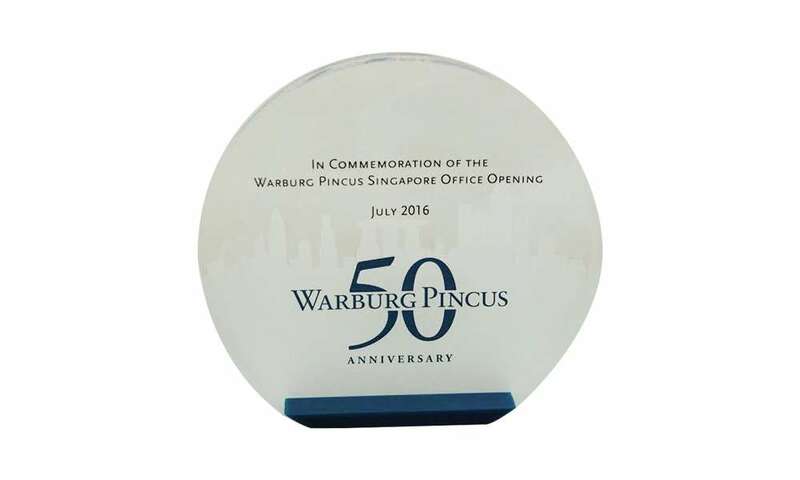 Custom acrylic award marking the 50th anniversary of the private equity firm Warburg Pincus, and the opening of the firm's Singapore office. 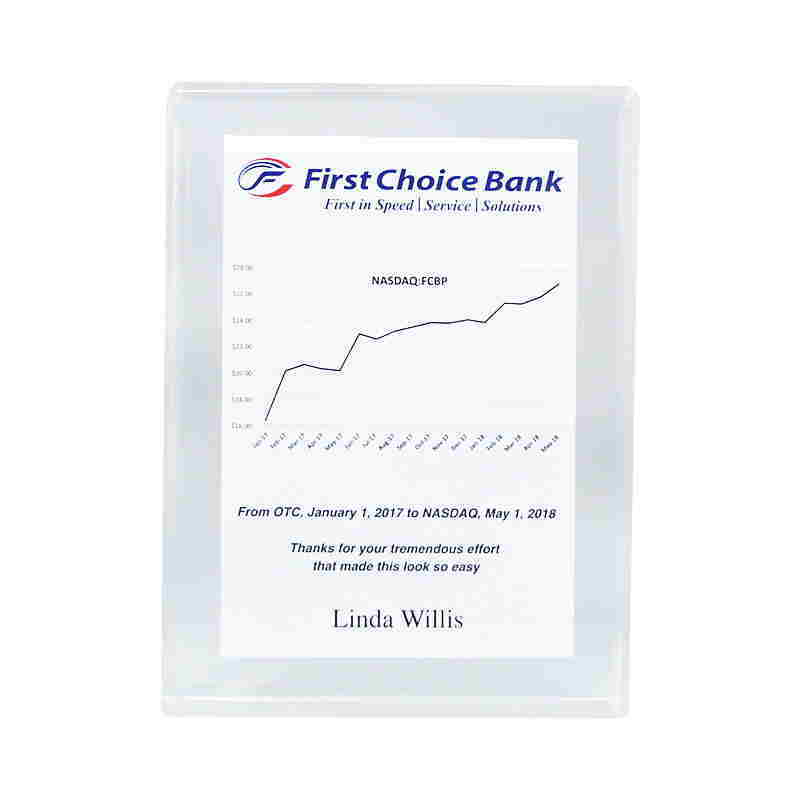 Acrylic commemorative celebrating participation in the opening bell ceremony at the NYSE. 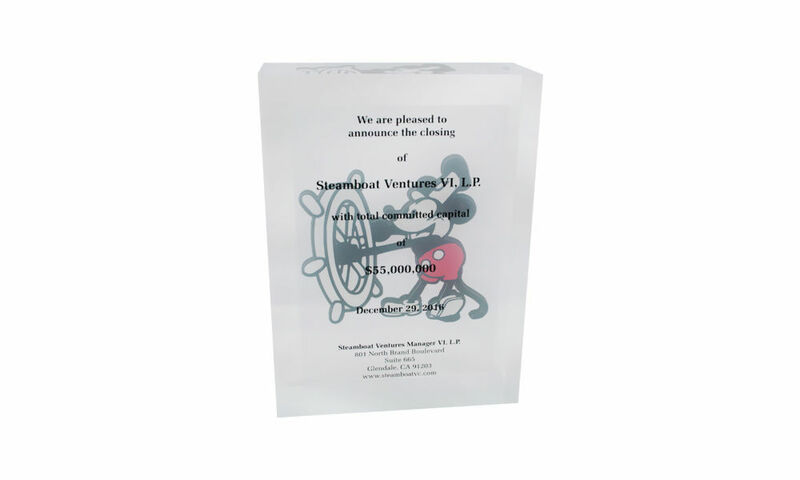 Custom acrylic award celebrating the closing of funding for Steamboat Venture VI, a fund created by the venture capital arm of the Walt Disney Company. 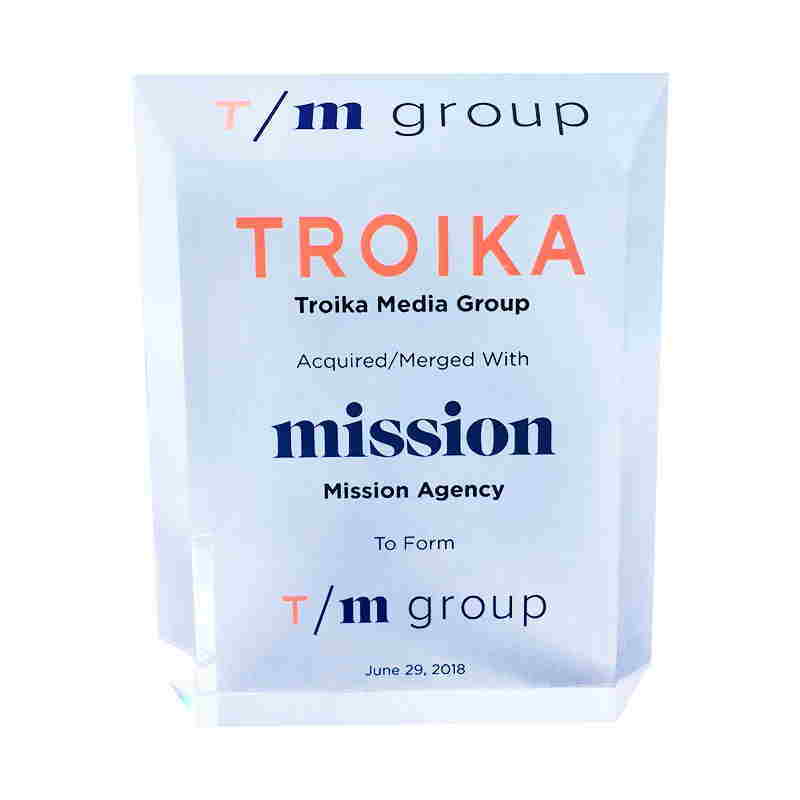 The firm's name derives from the Mickey Mouse cartoon Steamboat Willie. 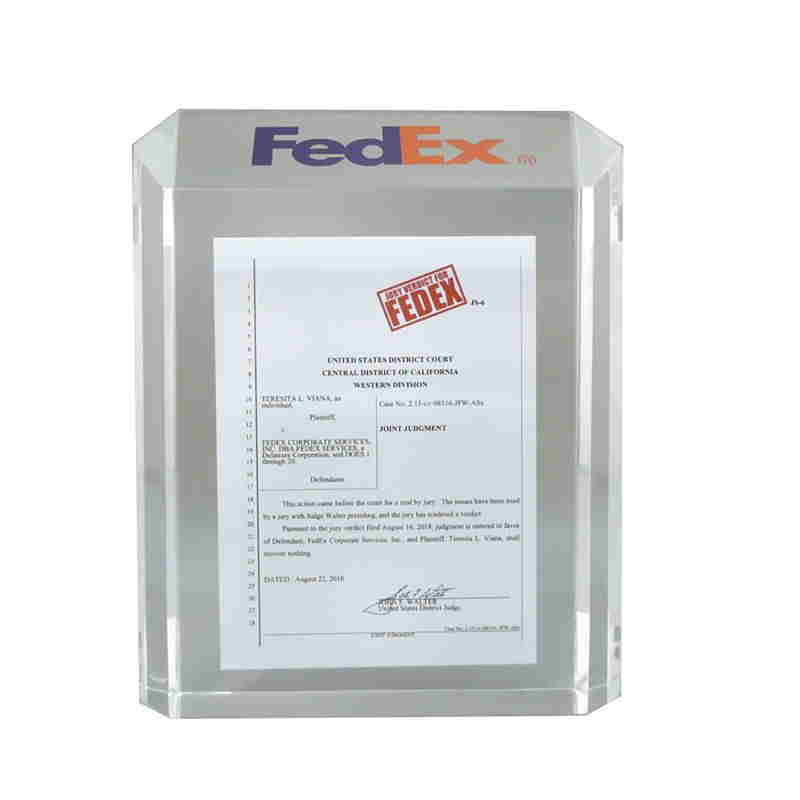 Custom Lucite commemorative commemorating a favorable legal decision in litigation involving the manufacturer of carbon steel pipes. 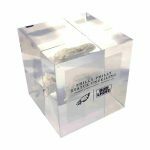 Dog bone-themed custom acrylic team award given by PetSmart. 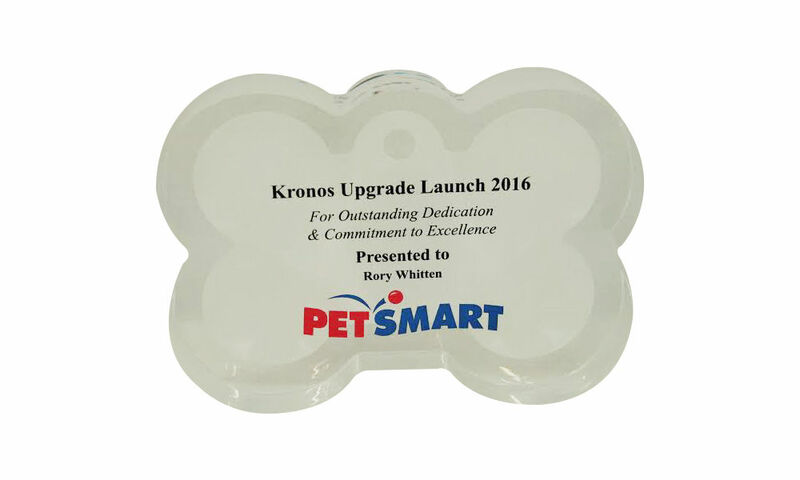 The pet-supply retailer is headquartered in Phoenix, Arizona. 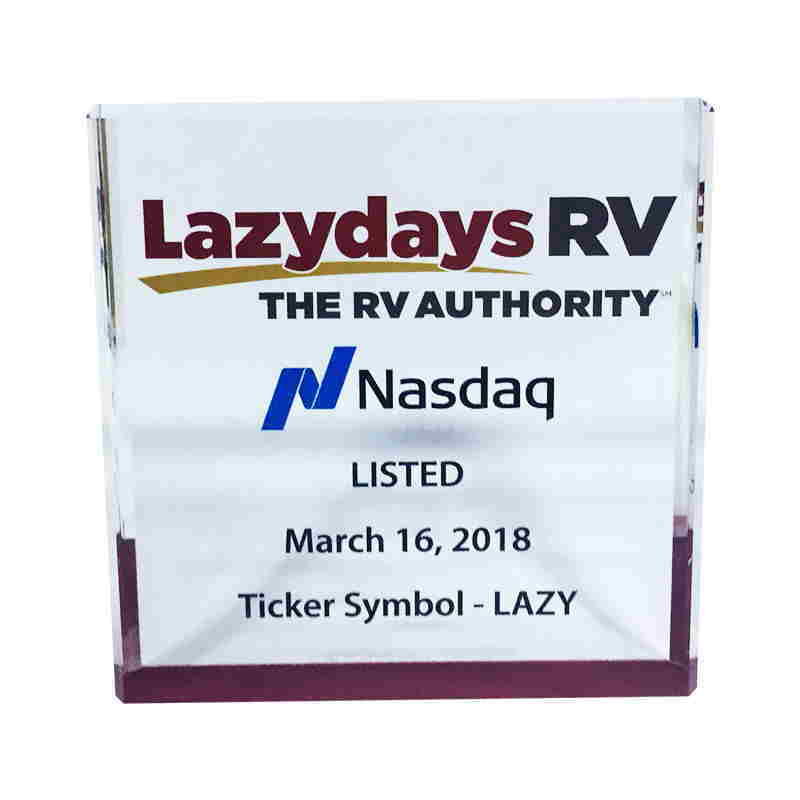 Crystal award commemorating the listing of Lazydays RV on the Nasdaq stock exchange. 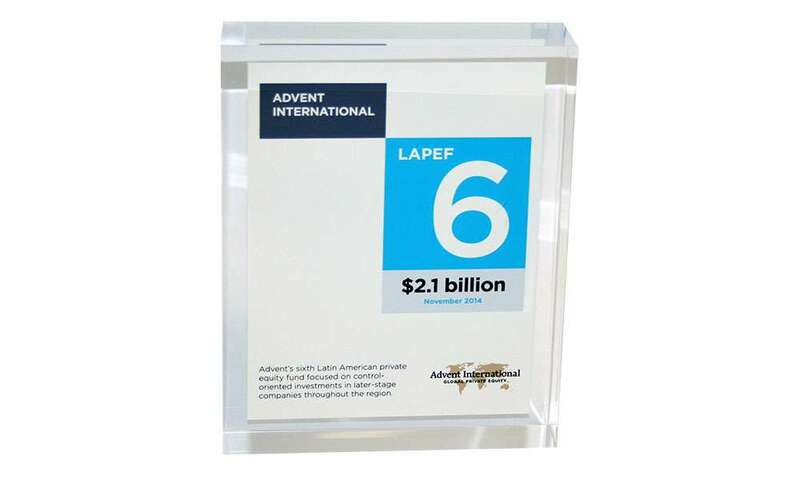 Lazdays is a recreational vehicle dealer. 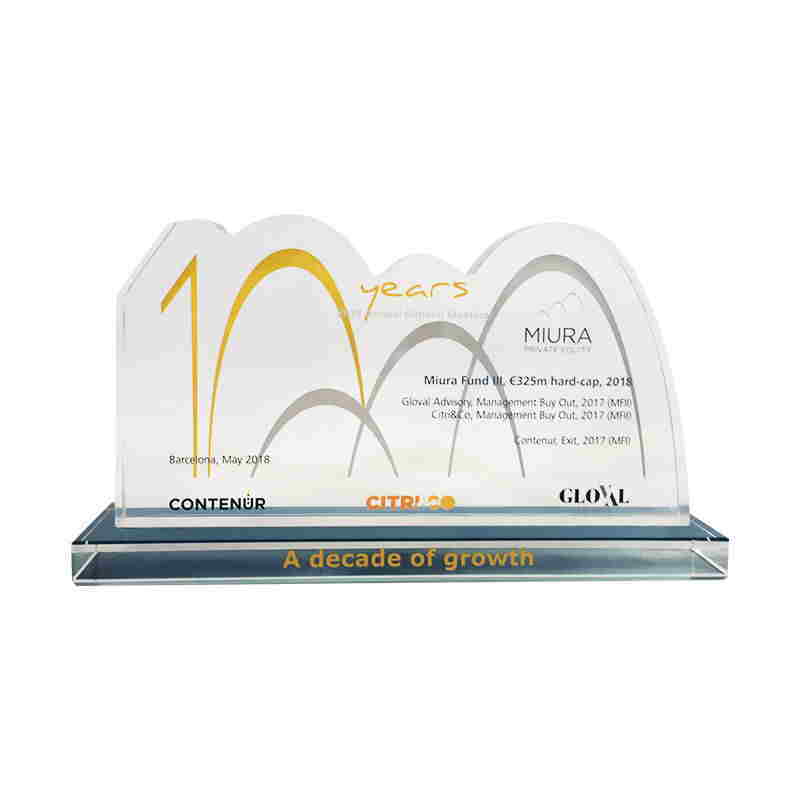 Custom Lucite marking the 10th anniversary of the founding of Miura Private Equity. 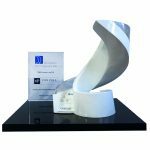 The anniversary also marked the closing of the firm's Miura Fund III. 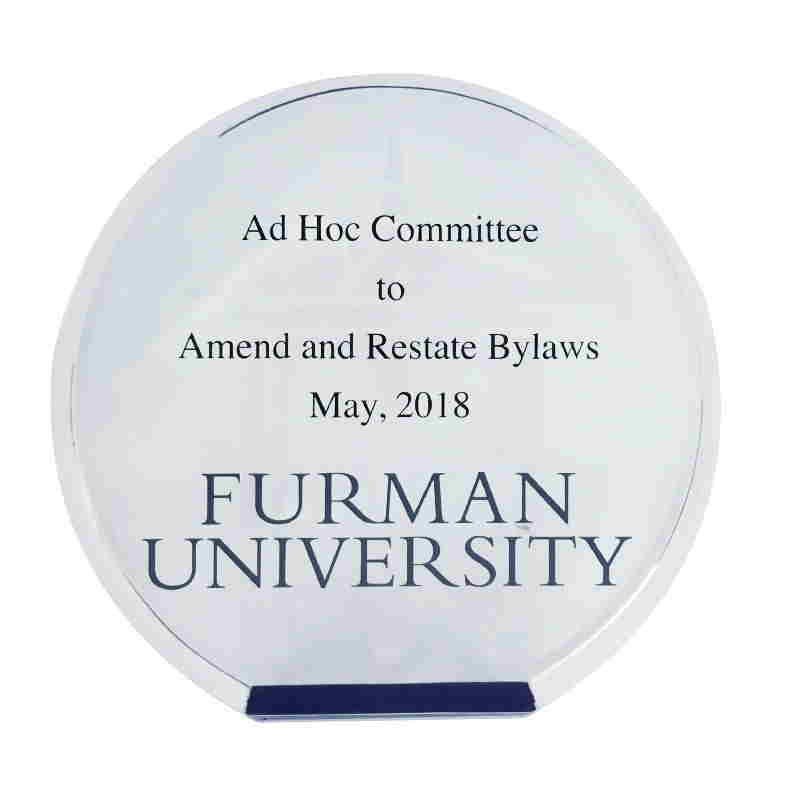 Custom crystal honoring the work of an ad hoc committee in amending and restating the bylaws of Furman University. 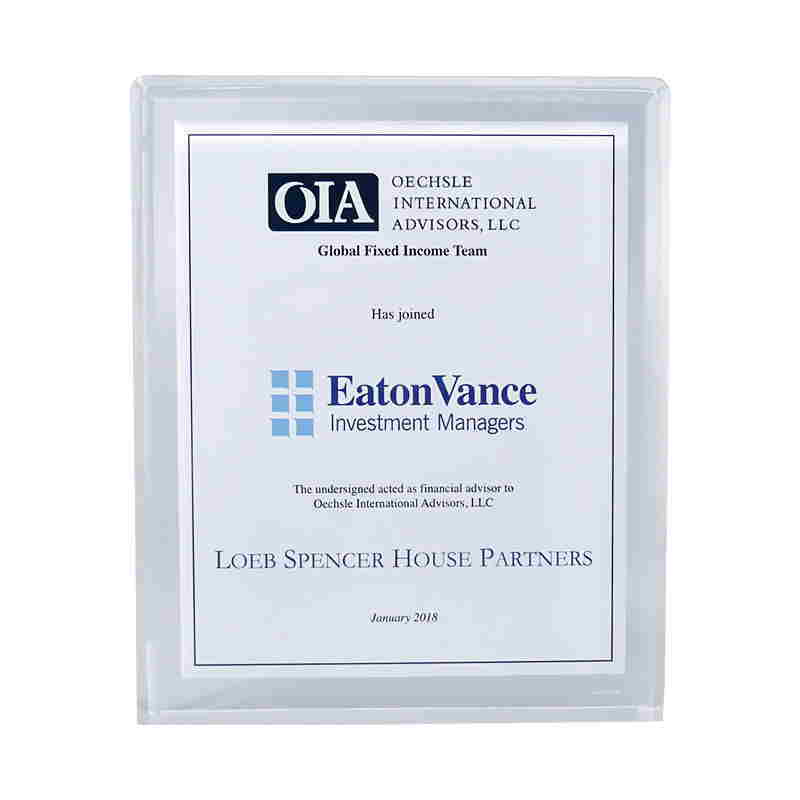 The university is located in Greenville, South Carolina. 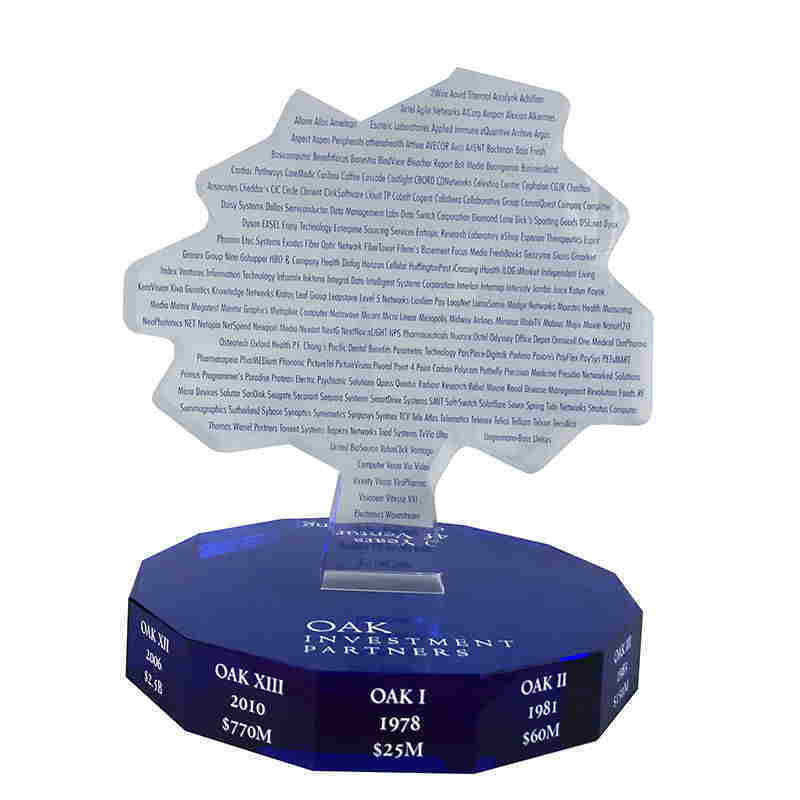 Custom acrylic client appreciation gift marking a favorable ruling in litigation. 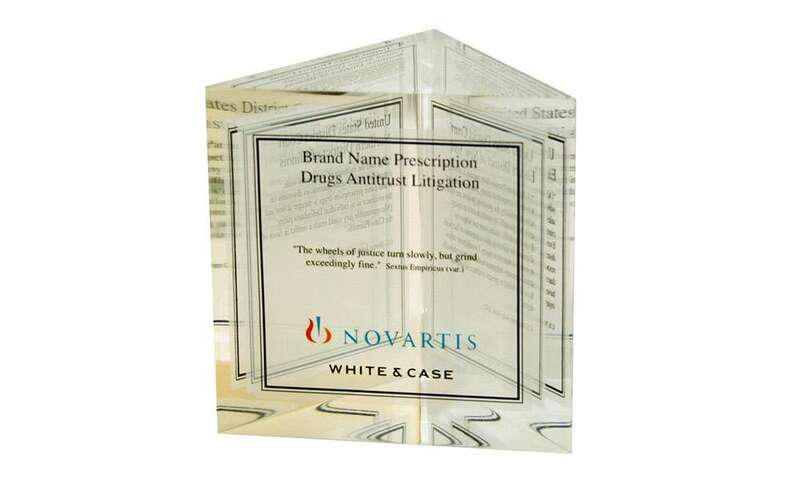 Custom acrylic award celebrating a favorable ruling in a pharmaceutical industry antitrust case. 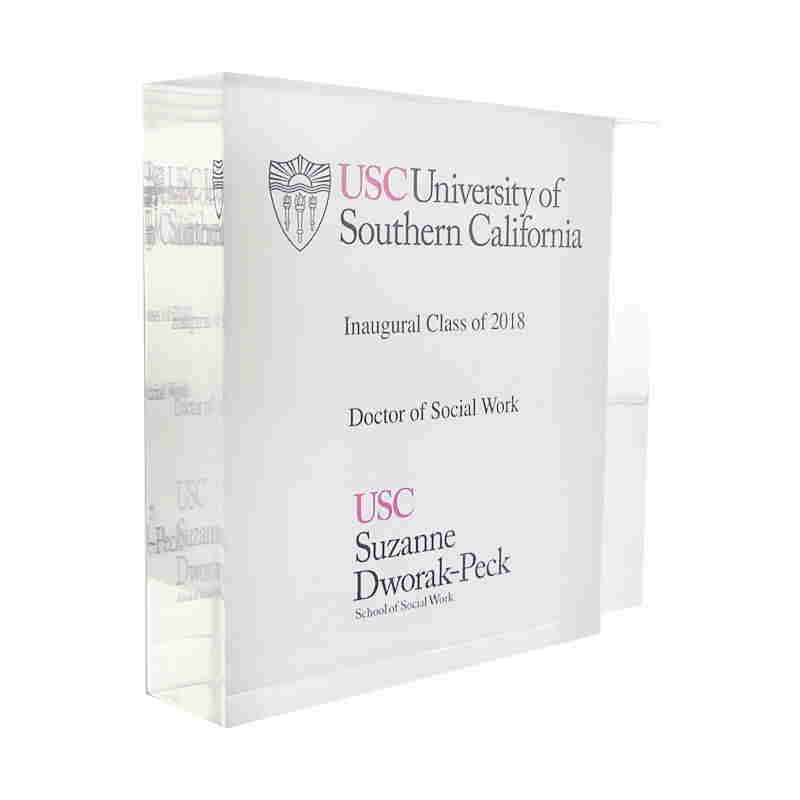 Award recognizing graduates of the inaugural class of the School of Social Work at the University of Southern California (USC). 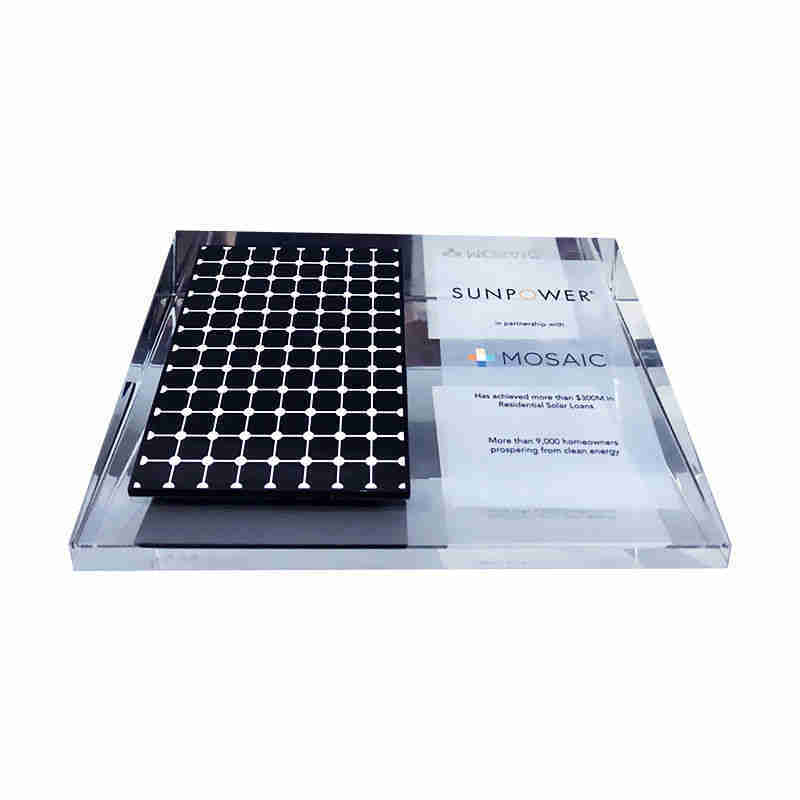 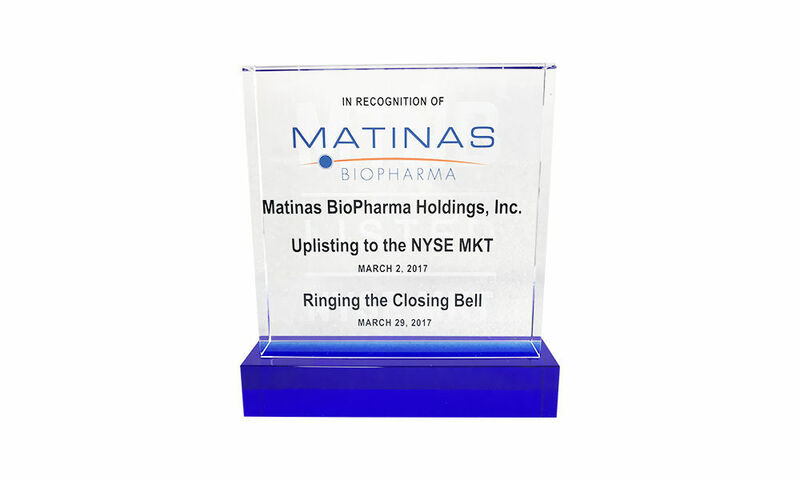 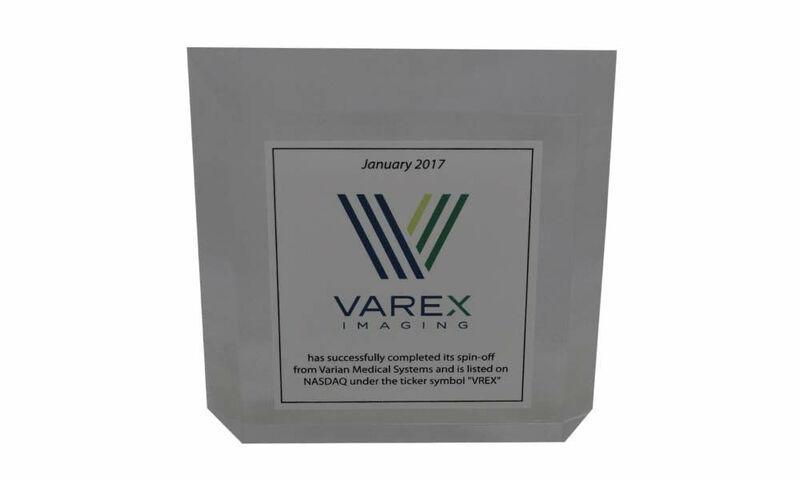 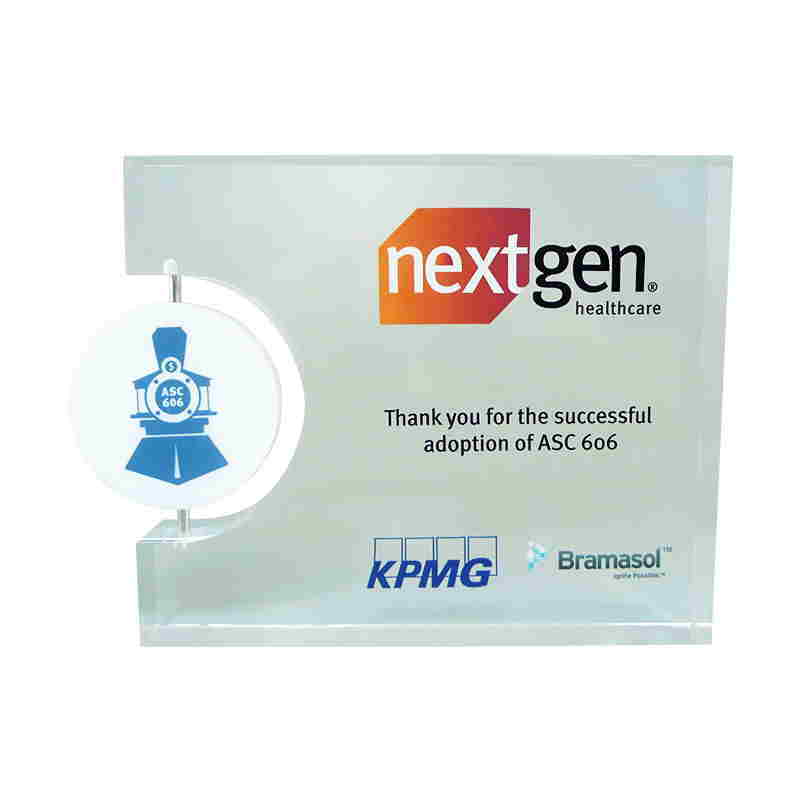 Custom acrylic award commemorating the listing of Varex Imaging on the Nasdaq Global Select Market, and also its spin-off from Varian Medical Systems. 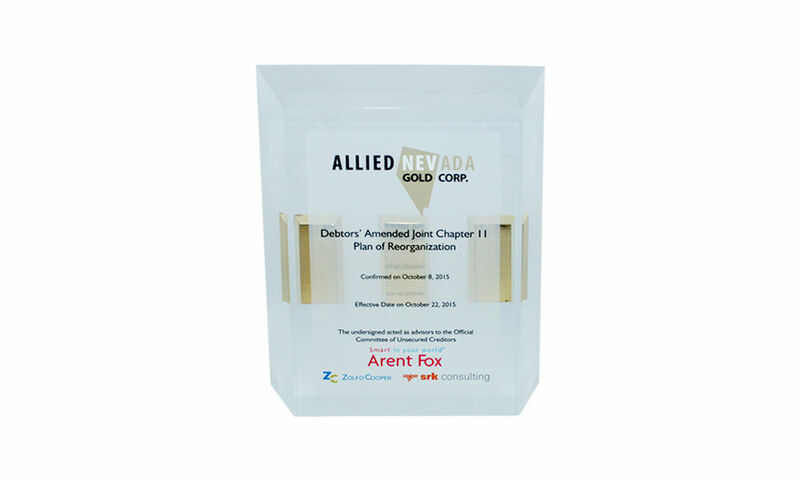 Custom acrylic award marking the approval of a Chapter 11 bankruptcy reorganization plan for Allied Nevada Gold, now Hycroft Mining Corporation. 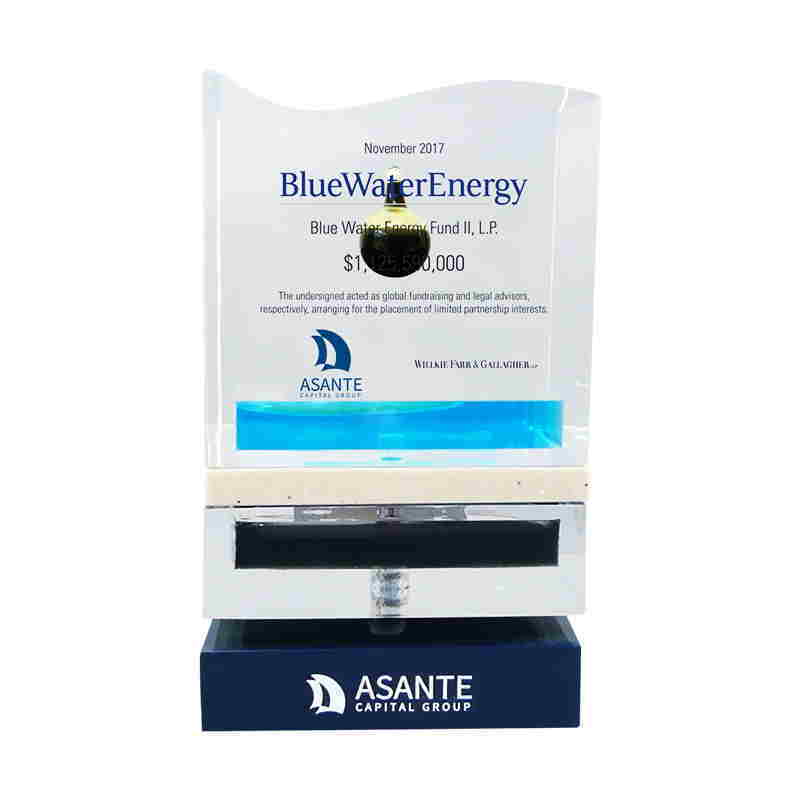 The restructured company is involved in silver and gold mining. 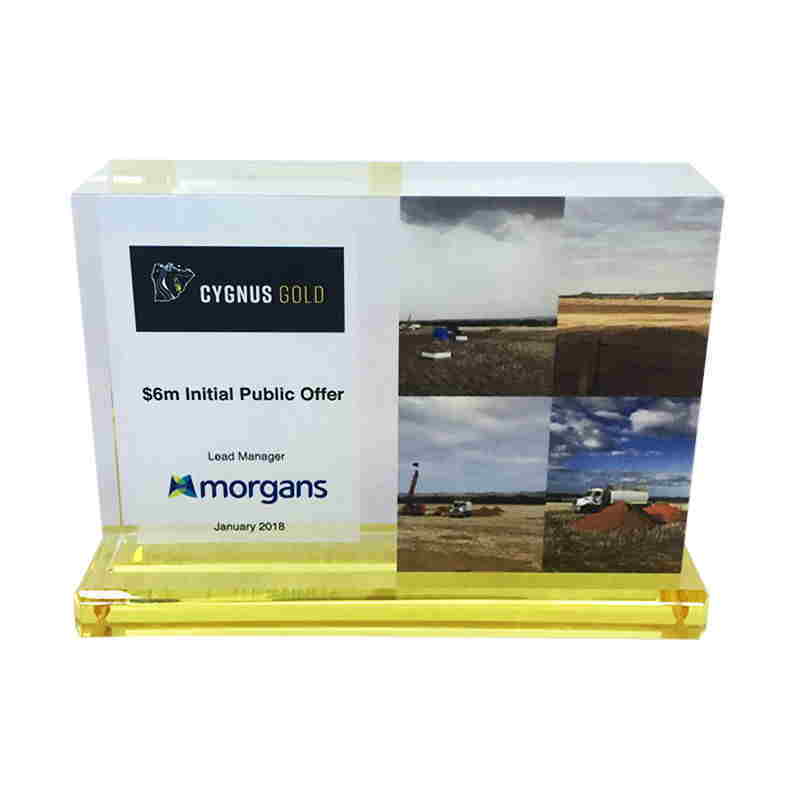 Custom crystal deal toy marking the initial public offering (IPO) of Cygnus Gold. 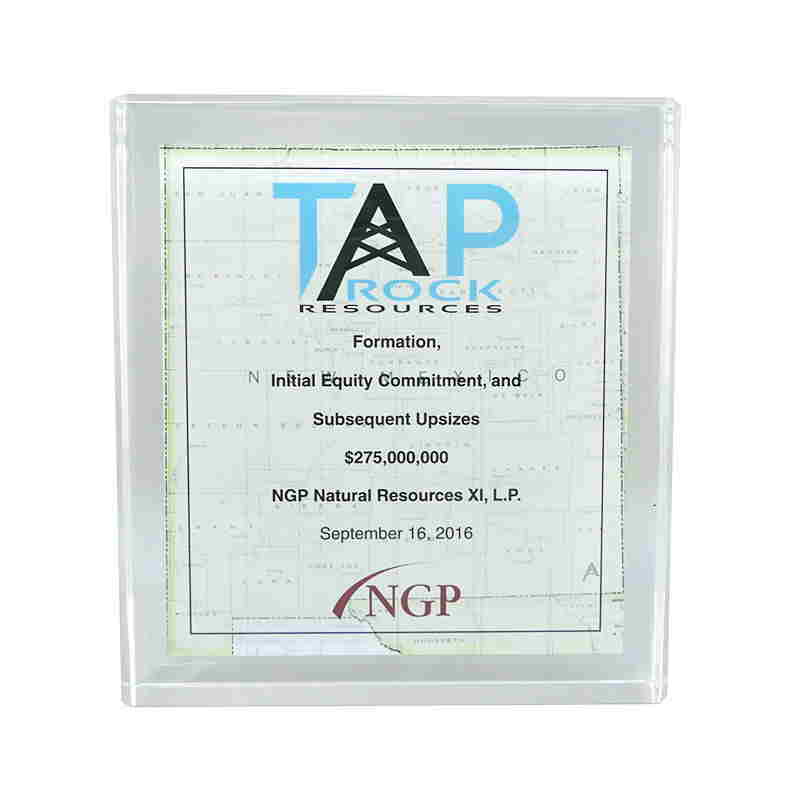 The company is focused on the discovery and exploration of gold deposits in Western Australia. 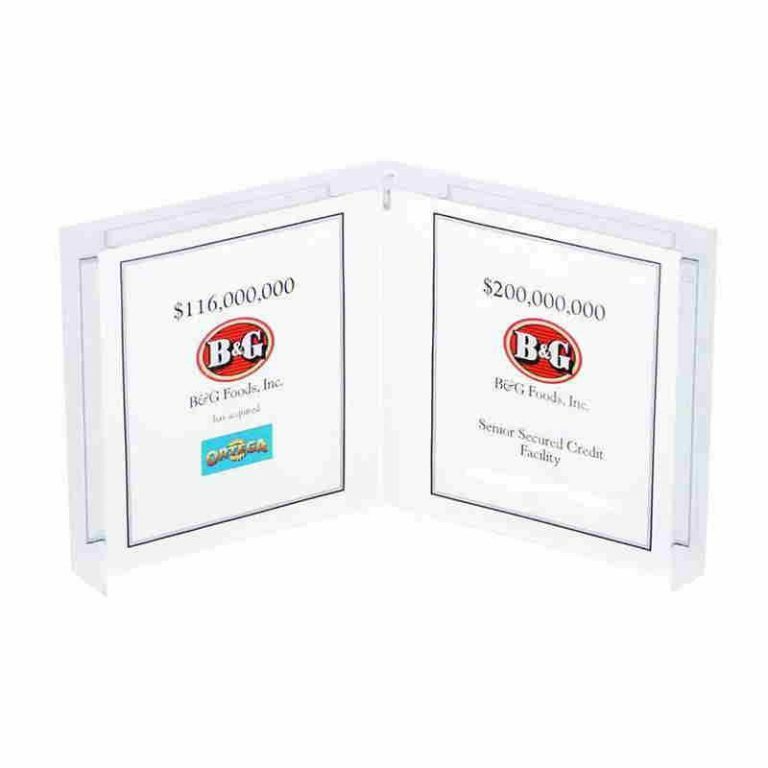 Morgans served as lead manager of the offering. 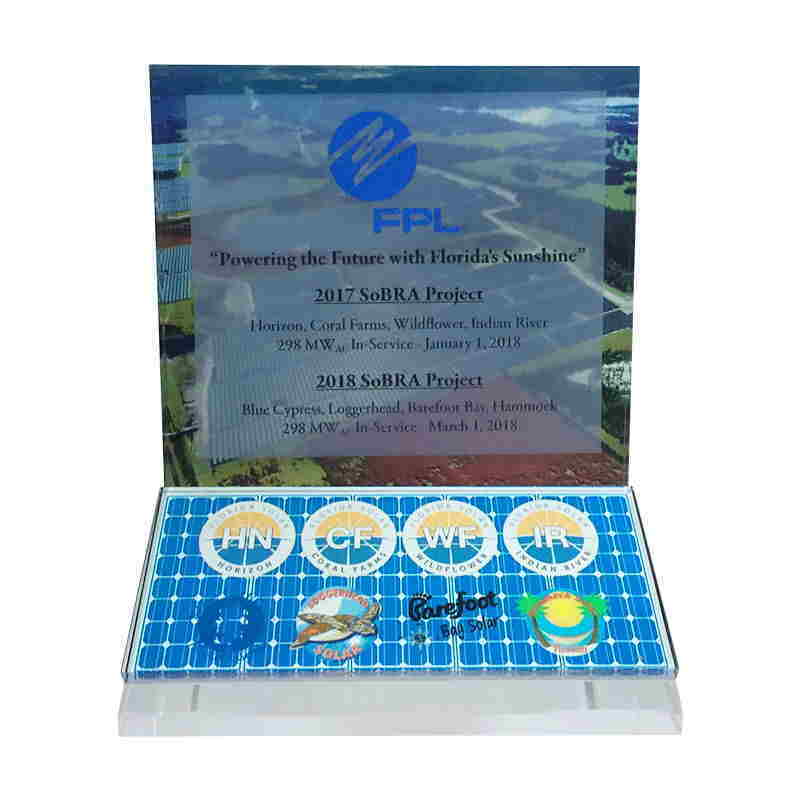 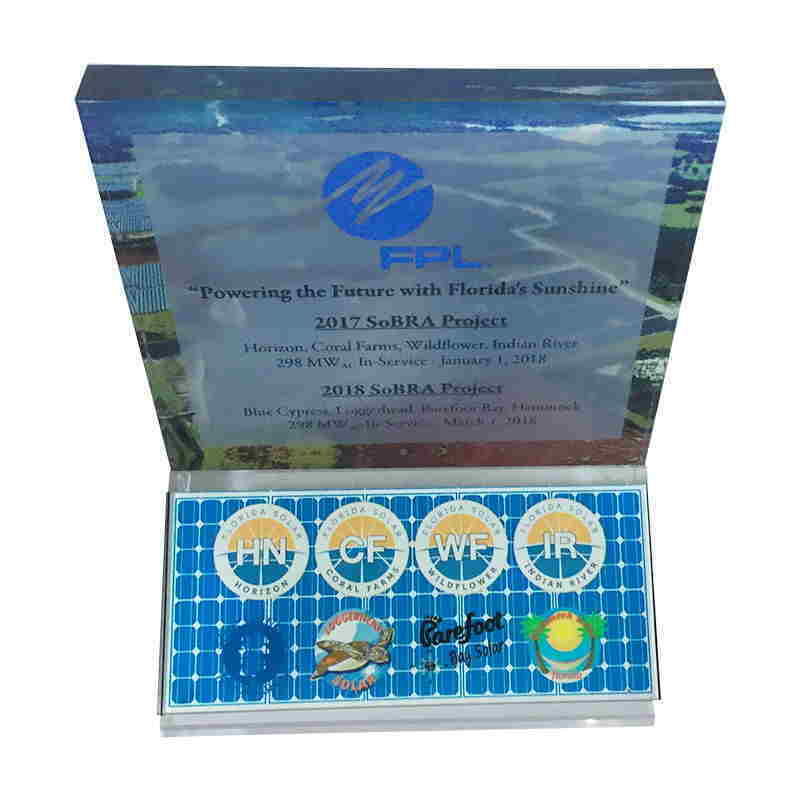 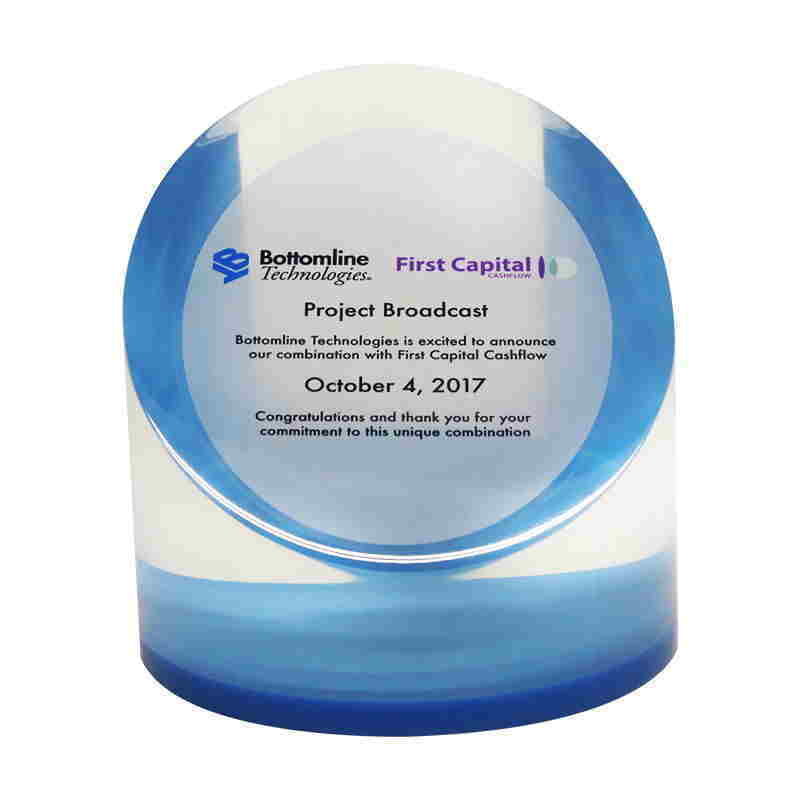 Custom acrylic commemorating the provision of $30 Million in financing by Arena Investor between May 24, 2017 and February 5, 2018. 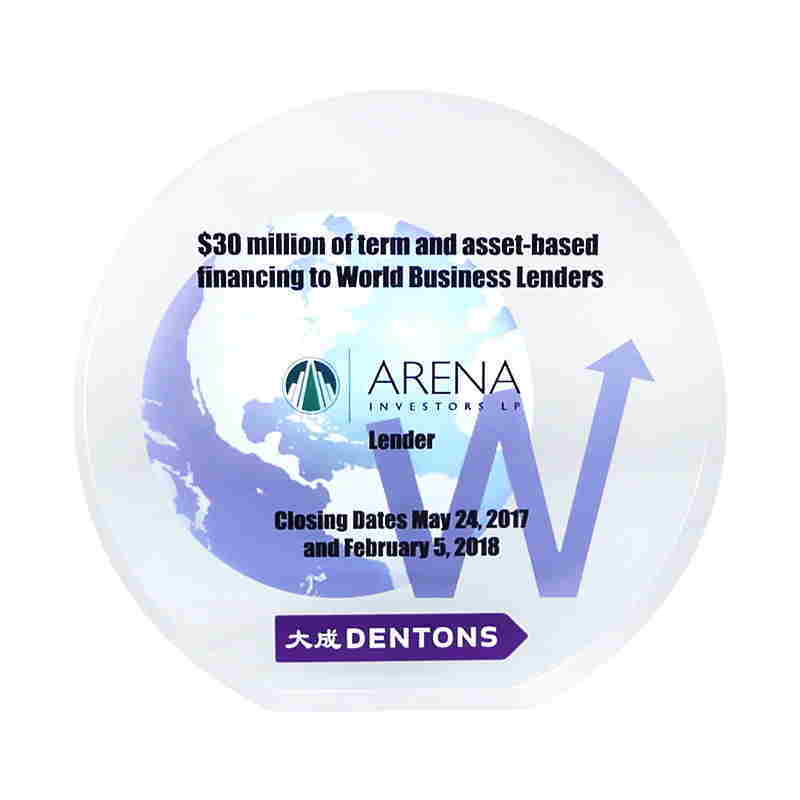 Arena specializes in bespoke and unconventional lending. 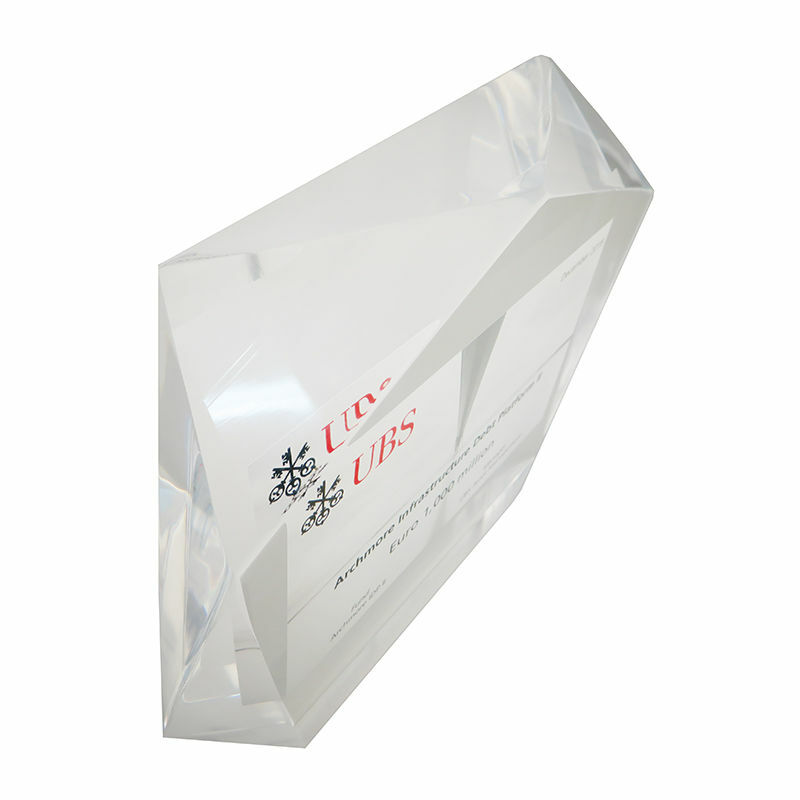 Lucite recognition award with embedded vial commemorating FDA approval of Giapreza. 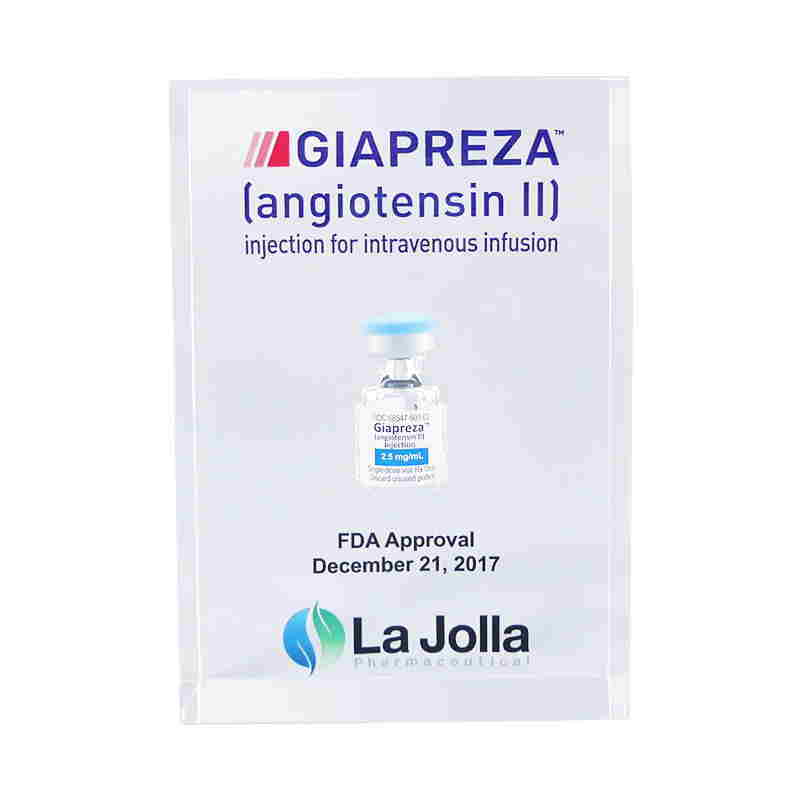 Giapreza was developed for the treatment of critically low blood pressure. 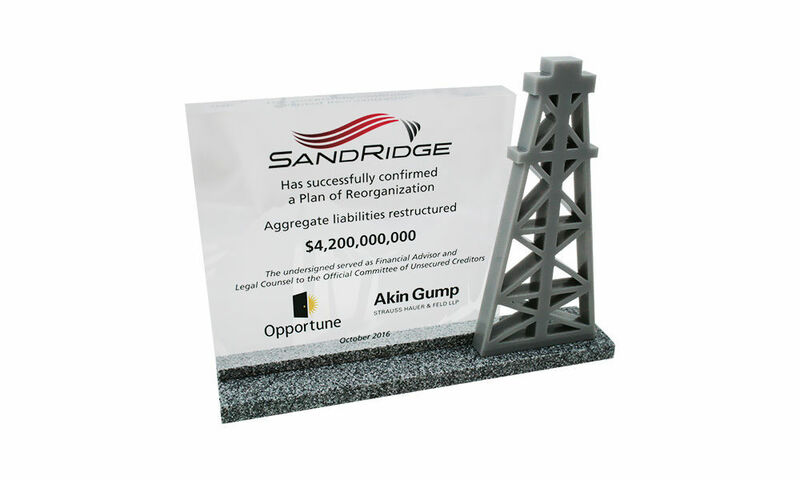 Oil rig-themed custom acrylic award recognizing the approval of the Chapter 11 reorganization plan for SandRige Energy. 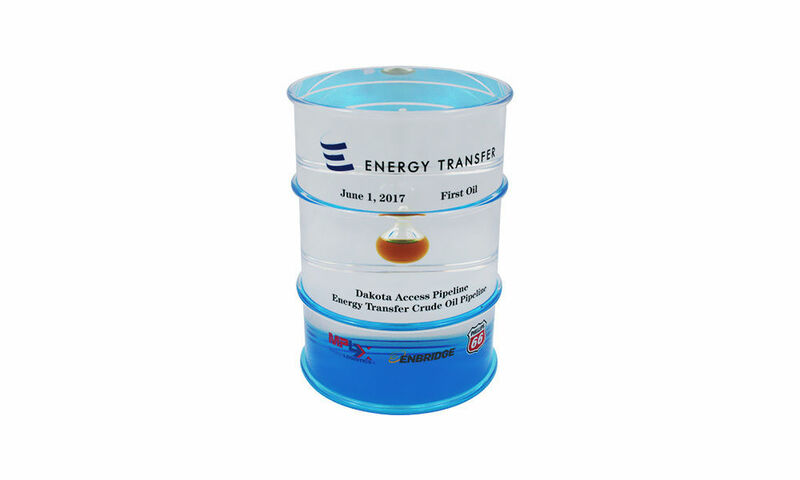 The oil and natural gas exploration and production company is based in Oklahoma City. 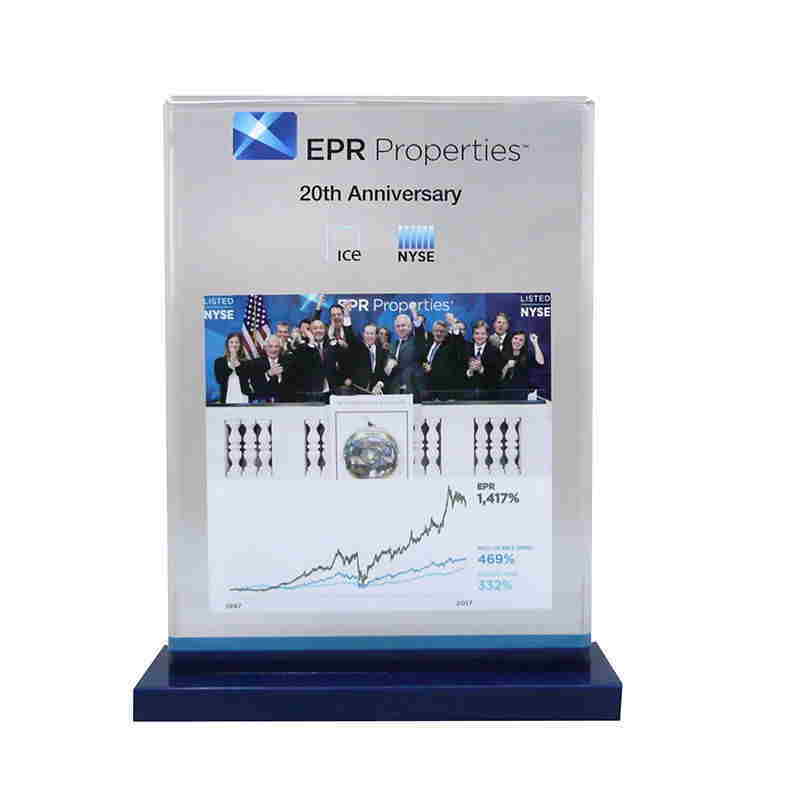 Custom crystal celebrating the 20th anniversary of the listing on the New York Stock Exchange of EPR Properties. 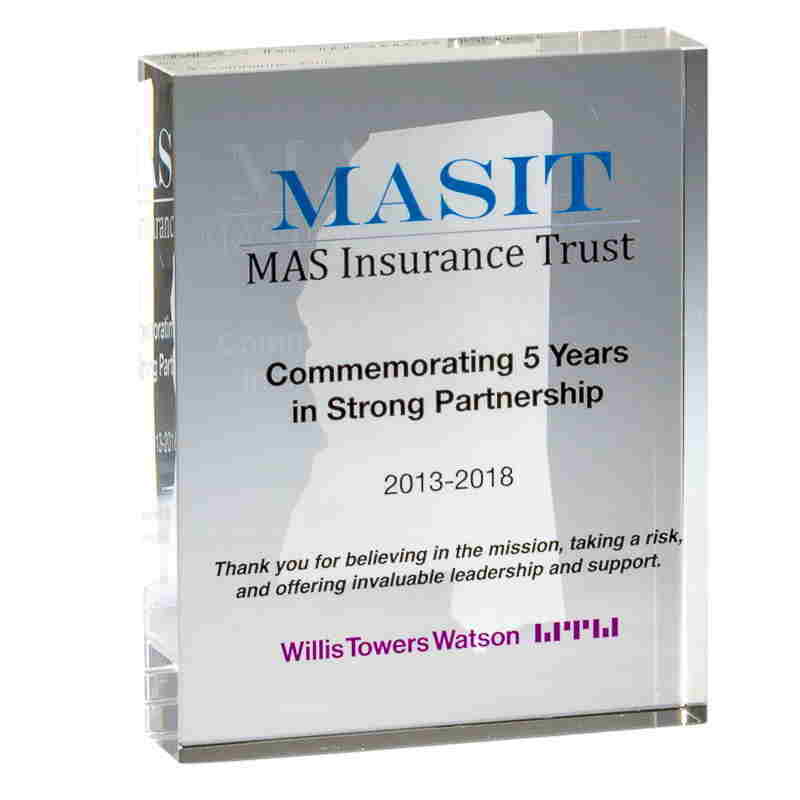 The Kansas City, Missouri-based Real Estate Investment Trust (REIT) was previously known as Entertainment Properties Trust. 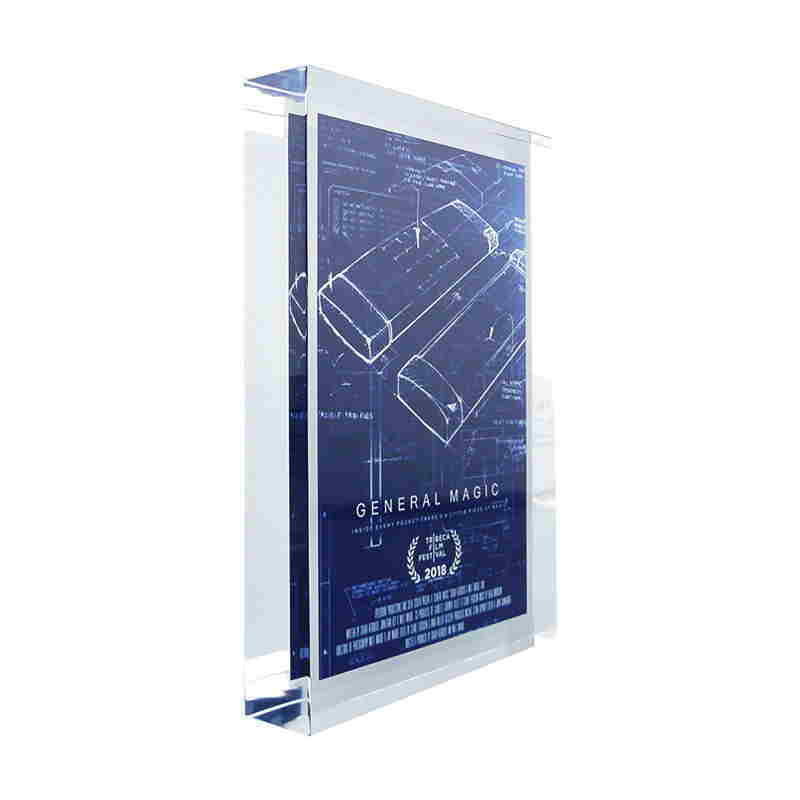 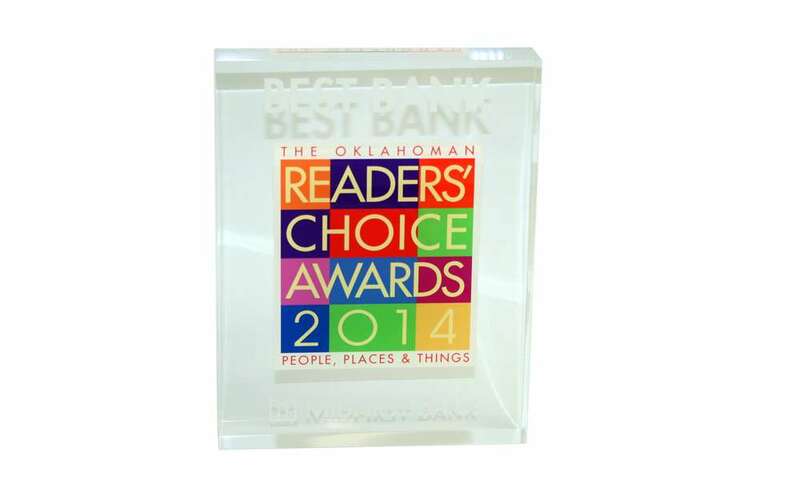 Oil barrel-themed custom acrylic award with embedded oil drop. 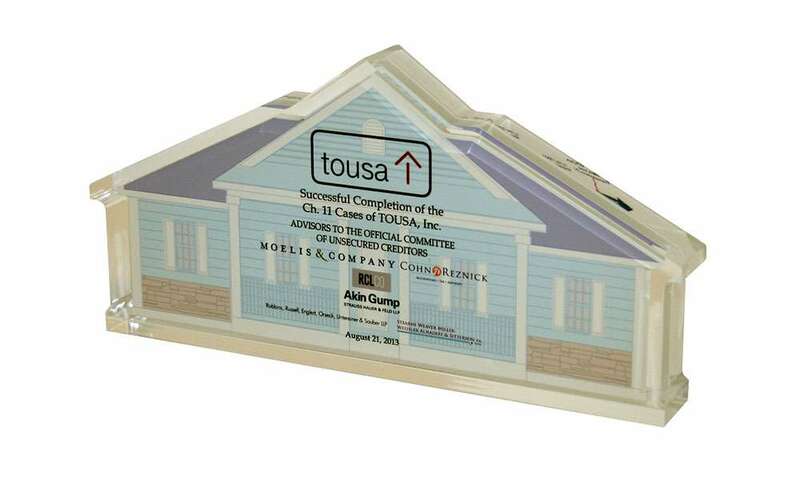 House-themed custom acrylic award commemorating the approval of a Chapter 11 bankruptcy plan for Florida-based home builder Tousa. 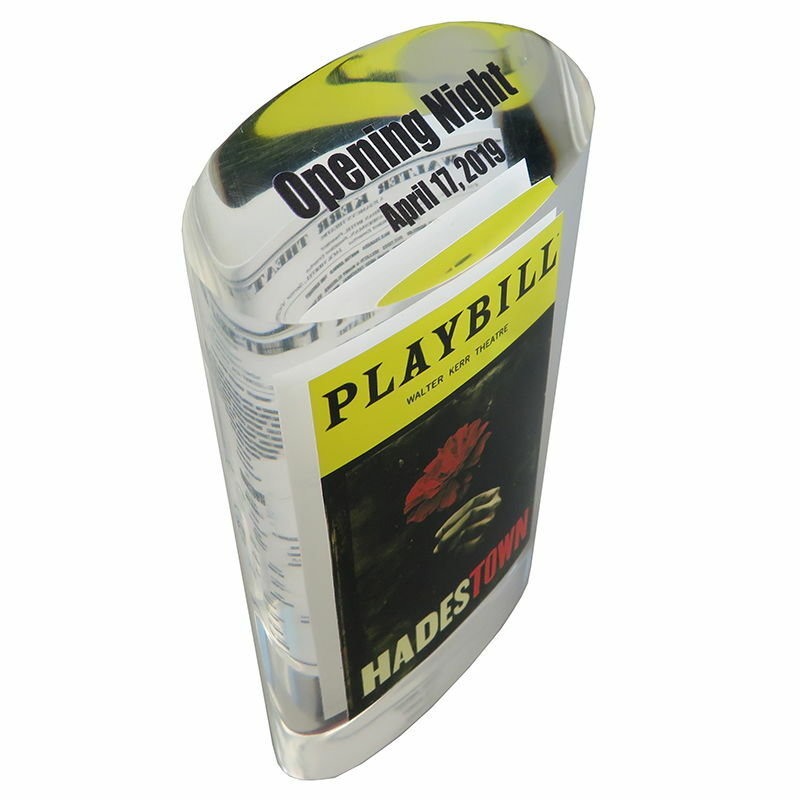 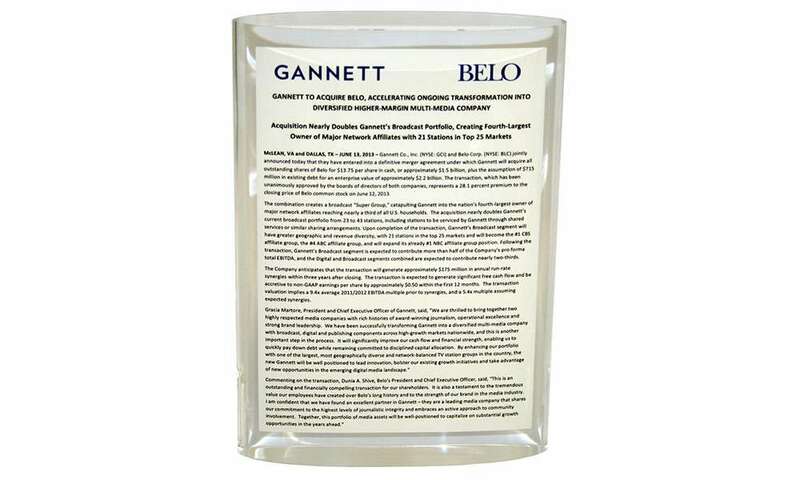 Custom Lucite displaying a press release announcing an acquisition by Gannett, the U.S. newspaper chain. 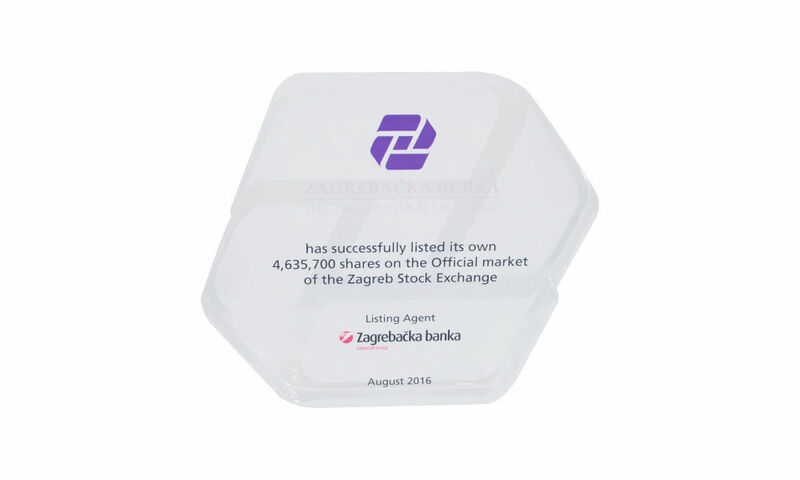 Custom acrylic award honoring the listing by the Zagreb Stock Exchange of its on shares on the exchange. 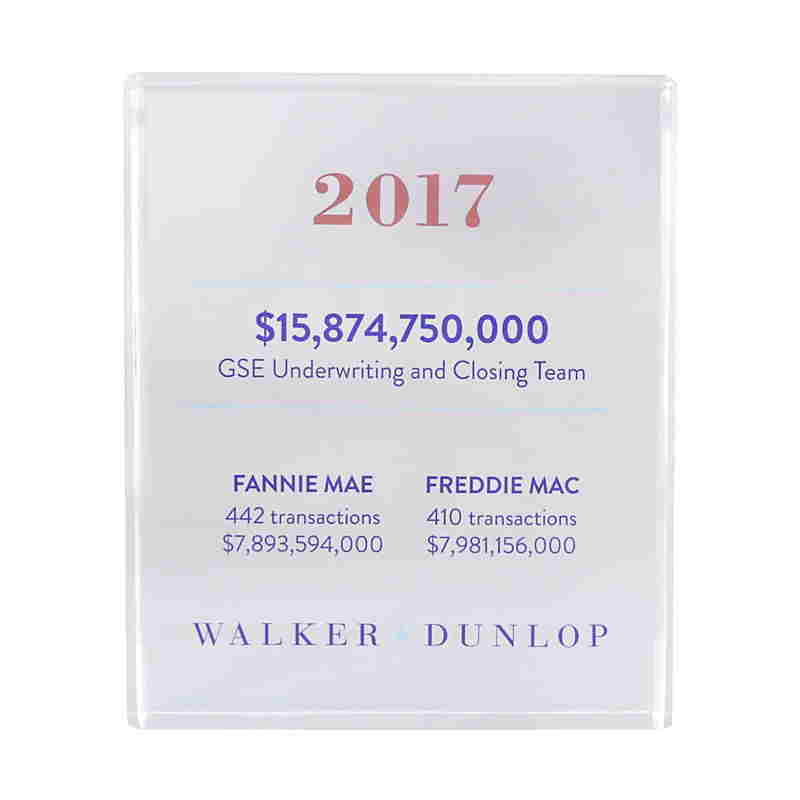 Custom crystal award celebrating the closing of Rubenstein Properties Fund III, focused on office properties in the eastern United States. 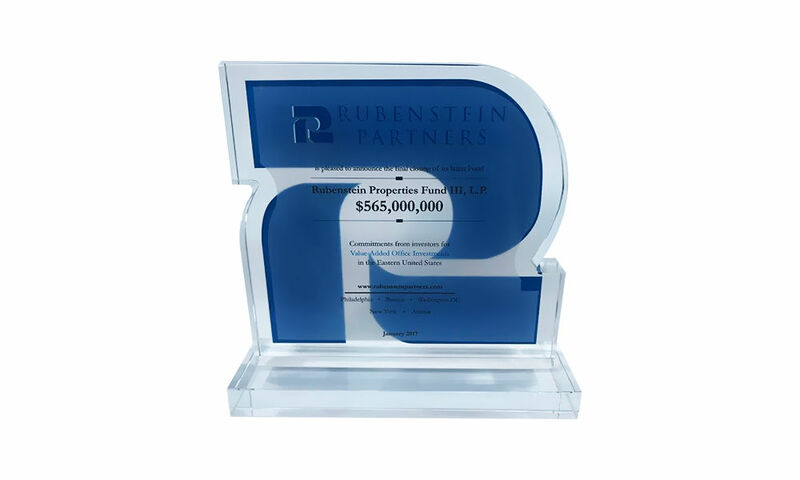 Rubenstein Partners is a private real estate investment management firm. 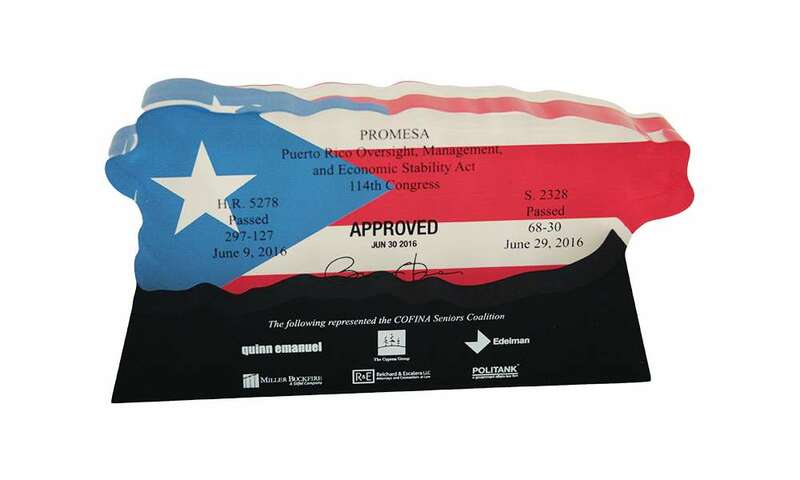 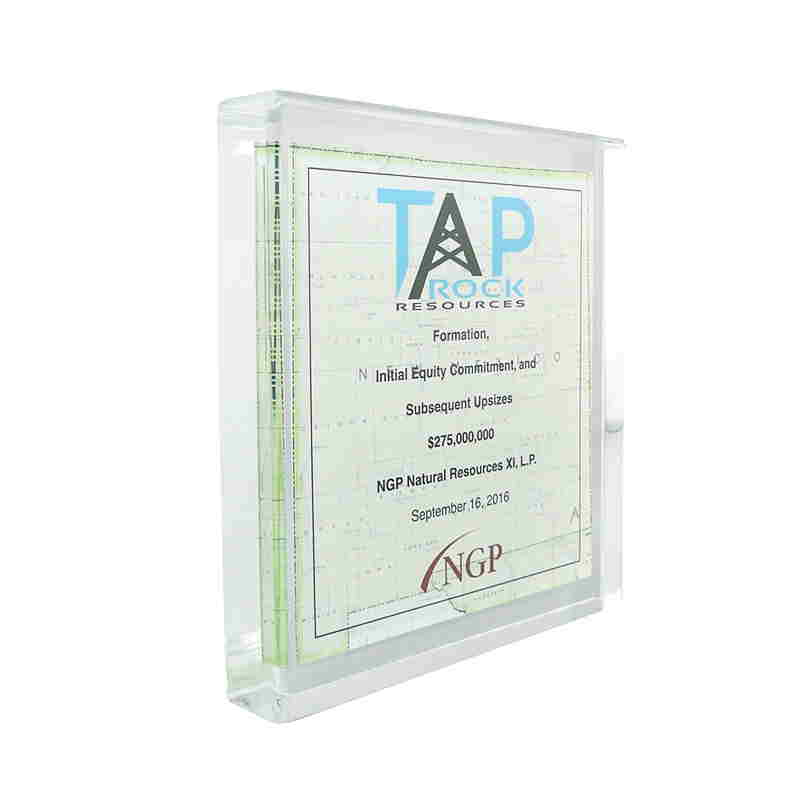 Custom acrylic award recognizing the approval of a Chapter 11 bankruptcy reorganization plan. 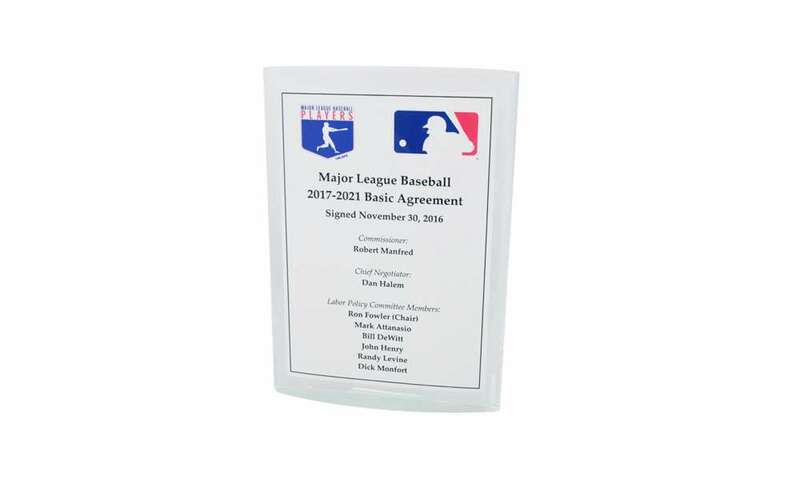 Custom Lucite celebrating the signing of a labor agreement for Major League Baseball. 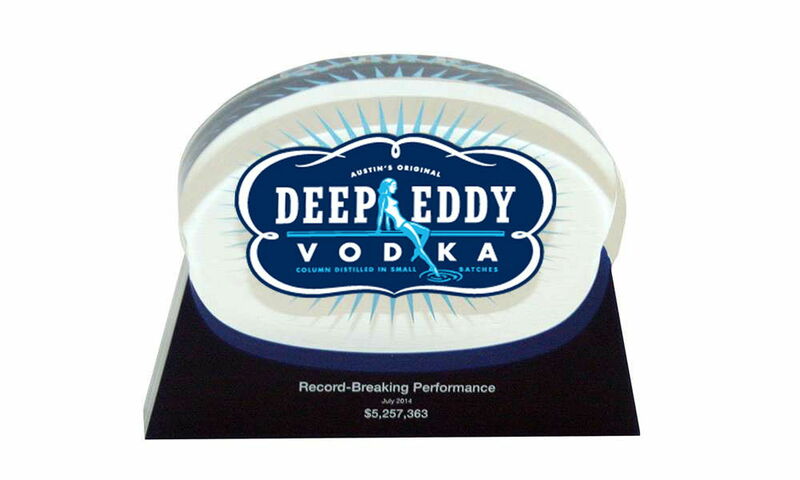 Custom acrylic team award recognizing the achievement of a sales milestone by Deep Eddy Vodka. 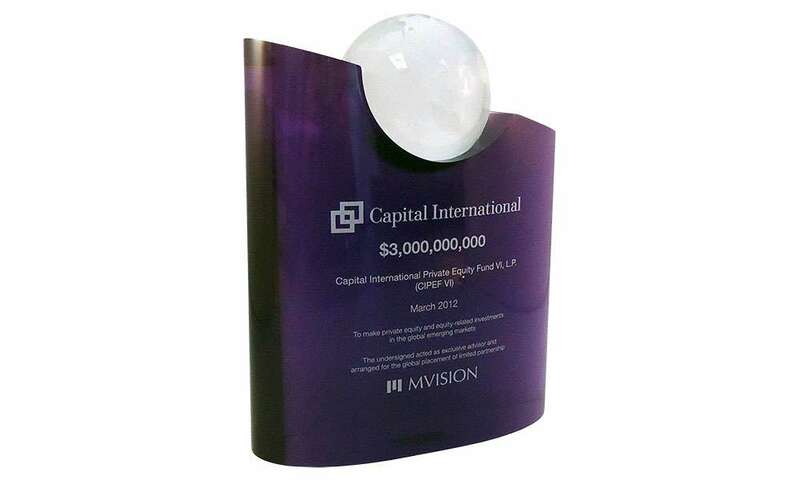 The craft vodka company is based in Austin, Texas. 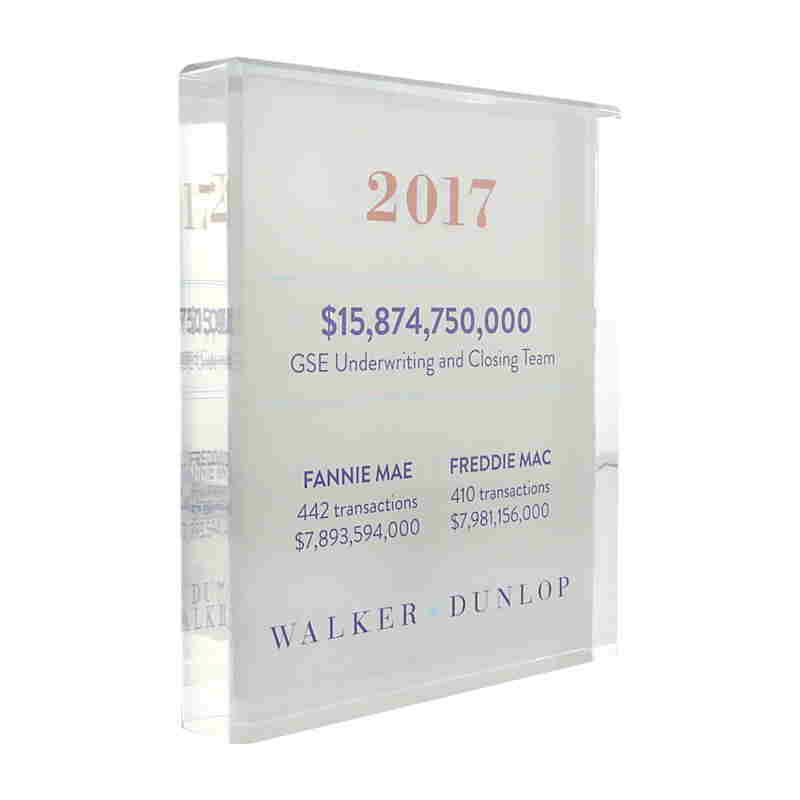 Custom acrylic commemorative announcing the addition of a global fixed income team to Eaton Vance. 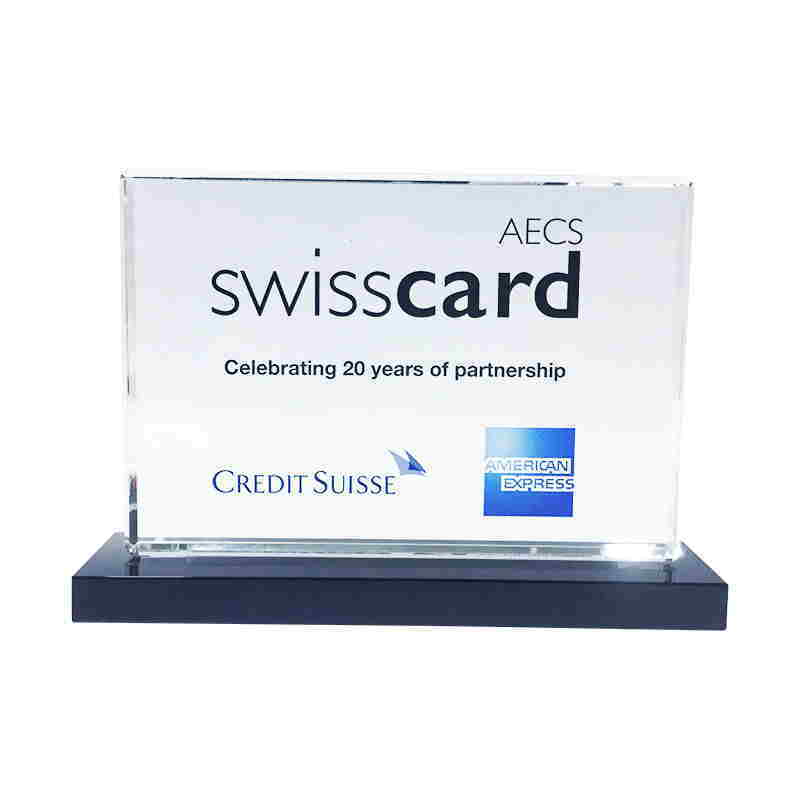 Custom Lucite marking the closing of a fund by private equity firm Advent International. 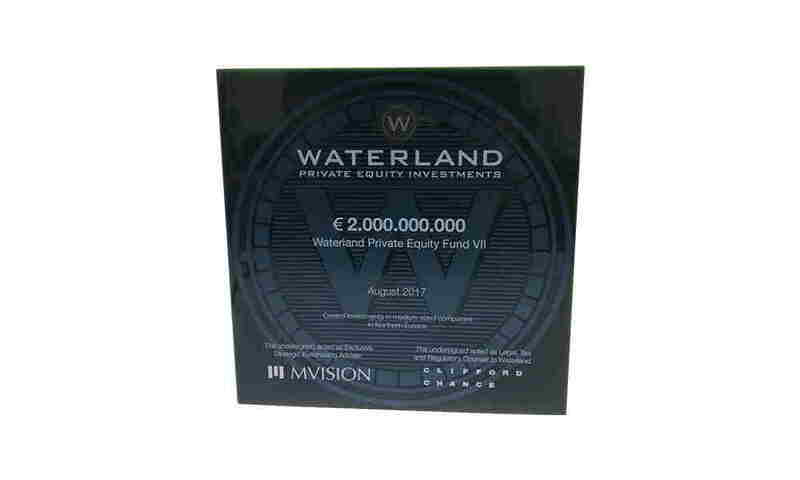 Custom acrylic award recognizing the closing of Waterland Private Equity Fund VII. 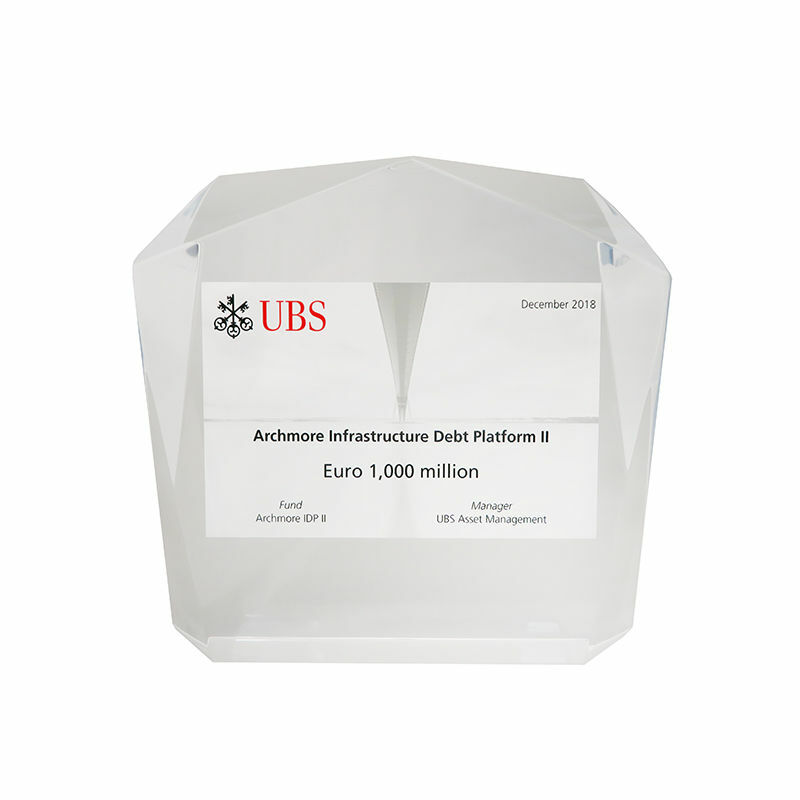 The Netherlands-based fund is focused on investments in mid-sized companies in Northern Europe. 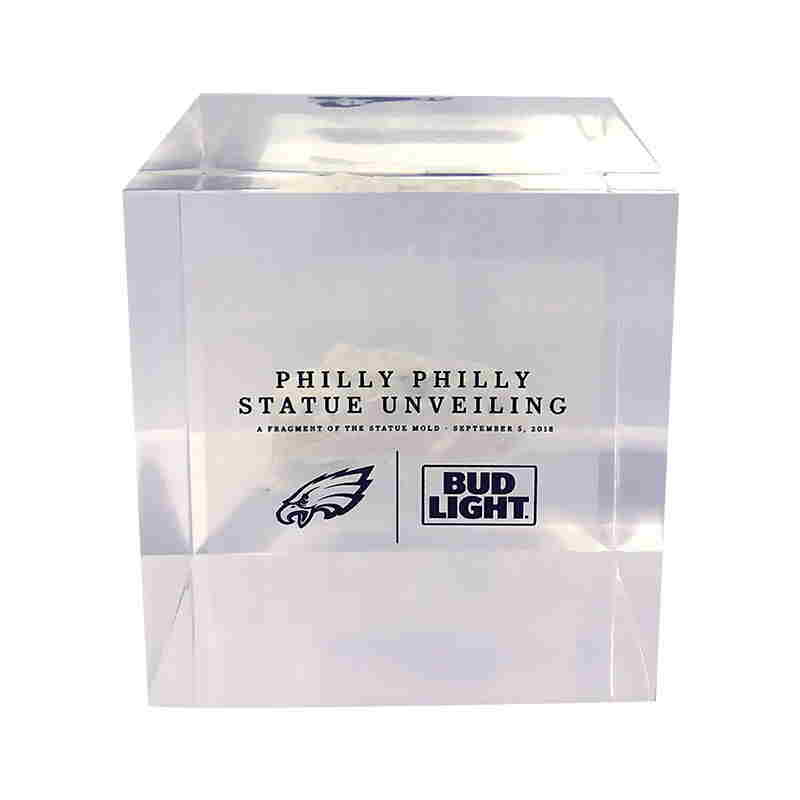 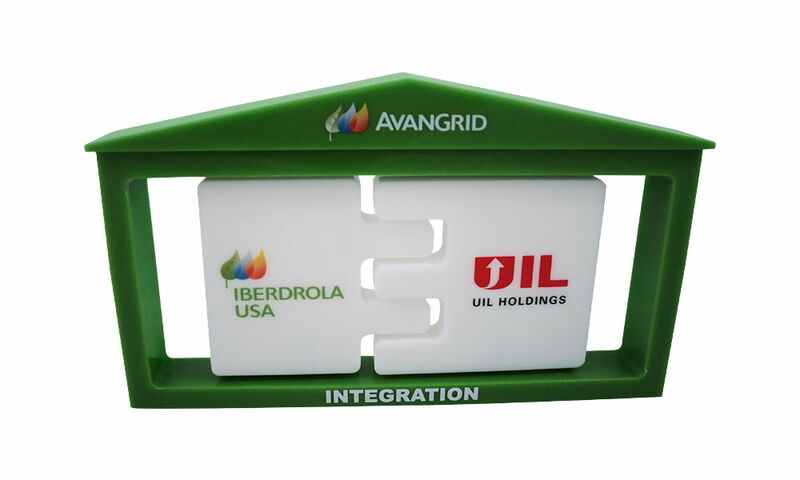 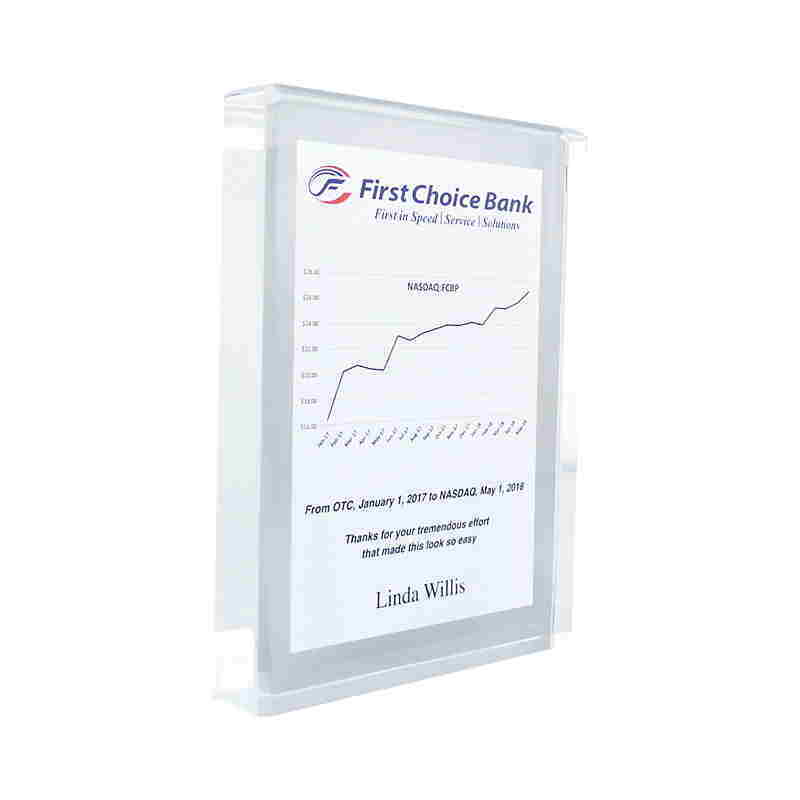 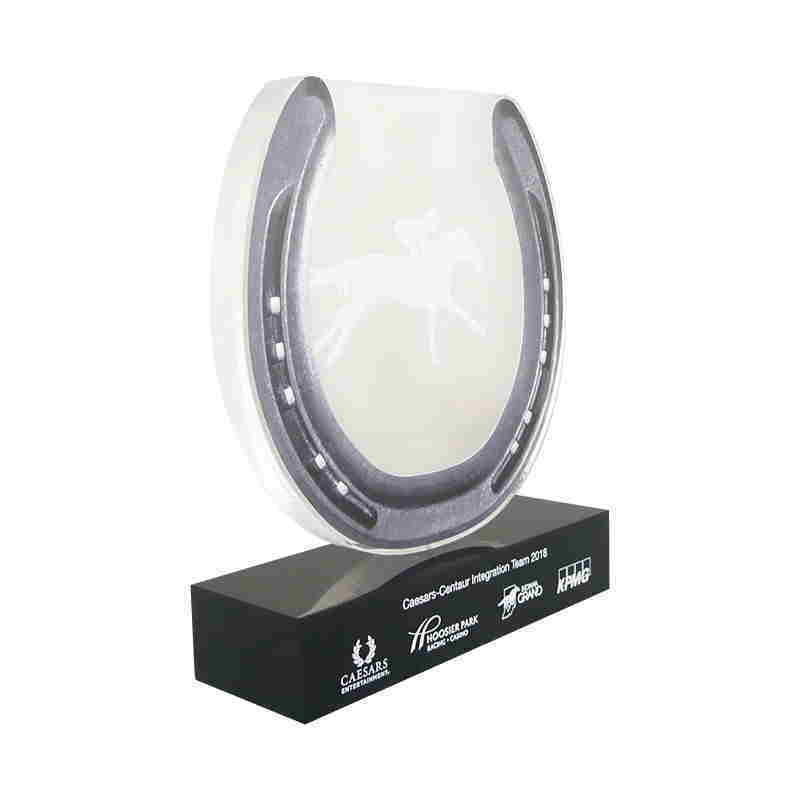 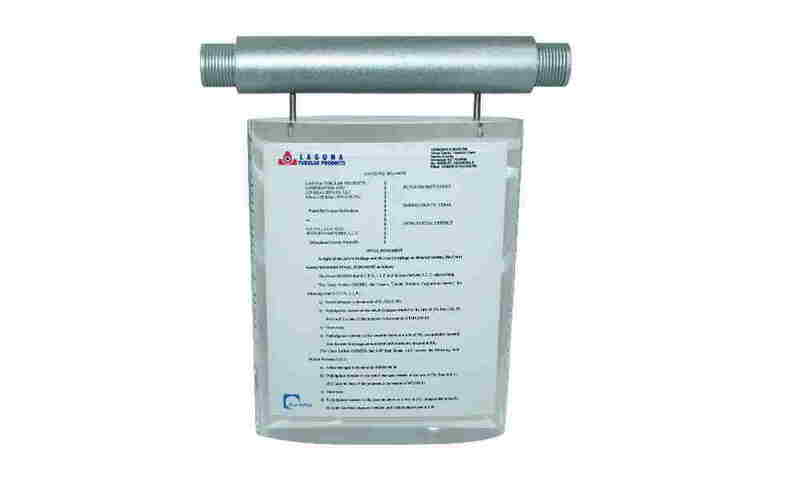 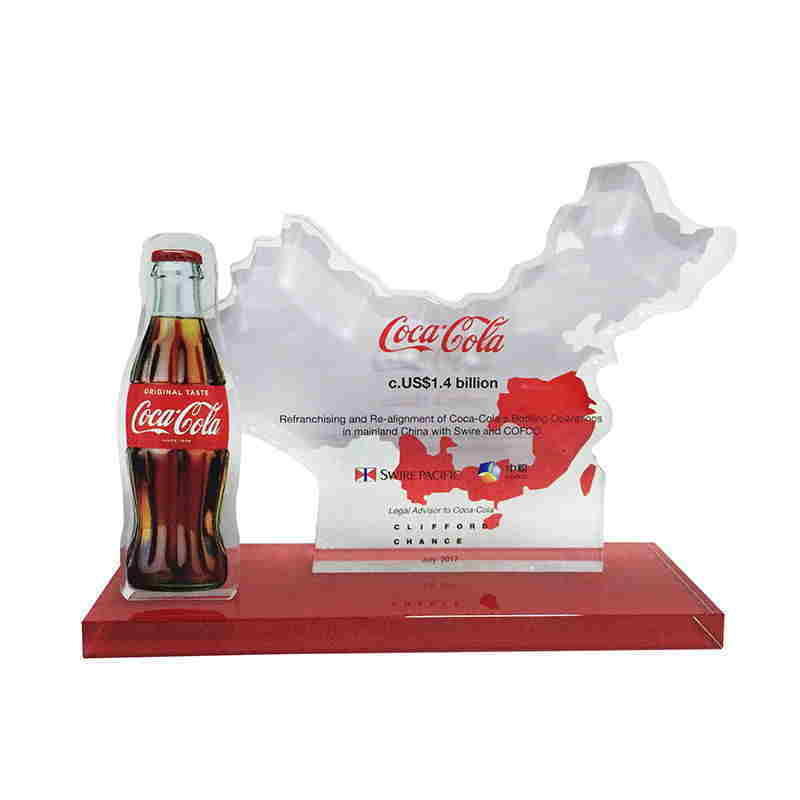 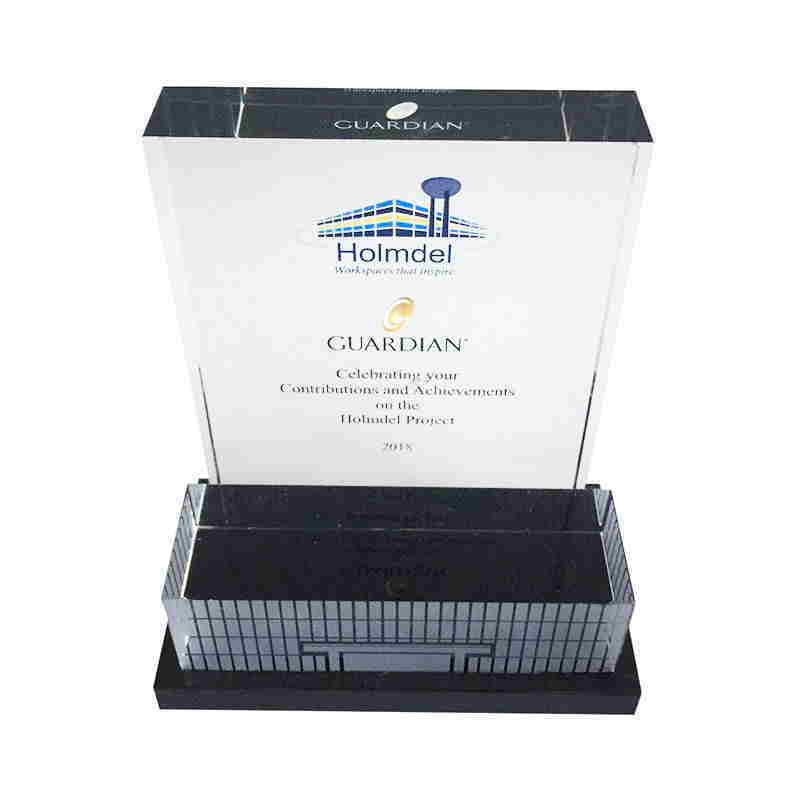 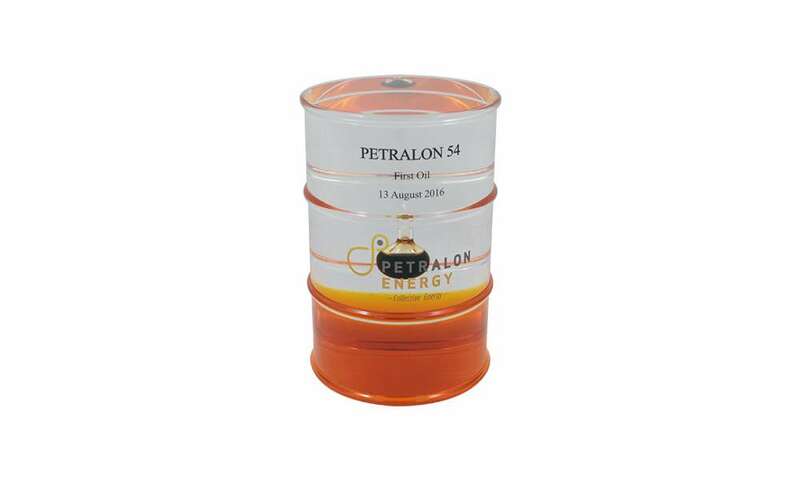 Custom acrylic award marking corporate profitability. 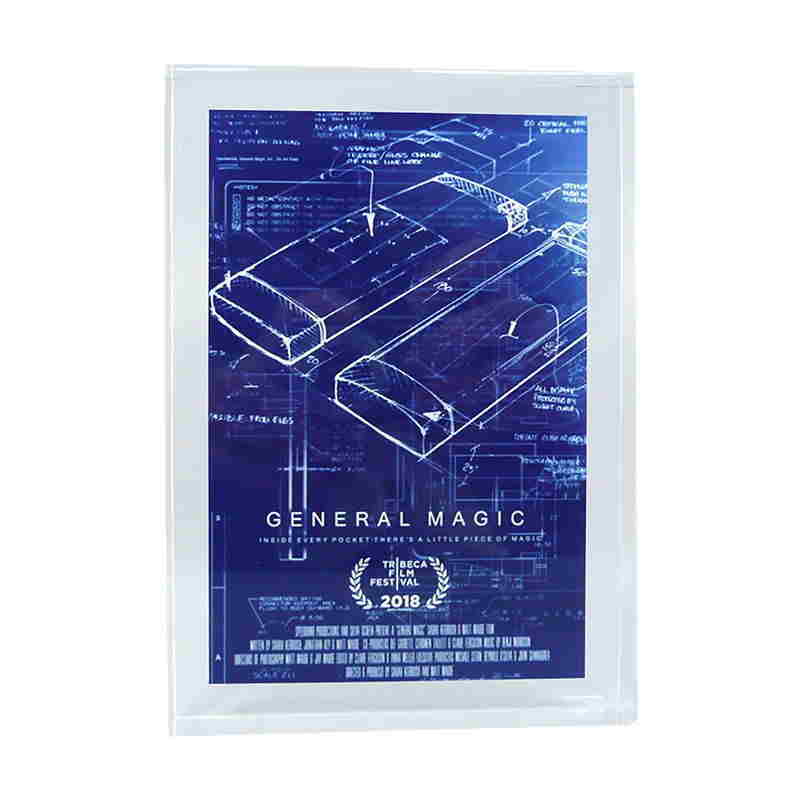 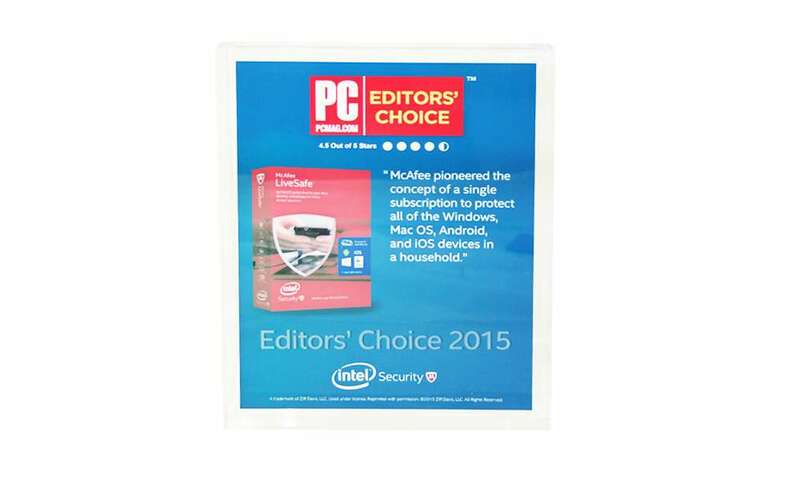 Lucite Display of PC Magazine's Editor's Choice award.